Wow! What a great time to visit Europe. The weather was cool and mostly sunny. 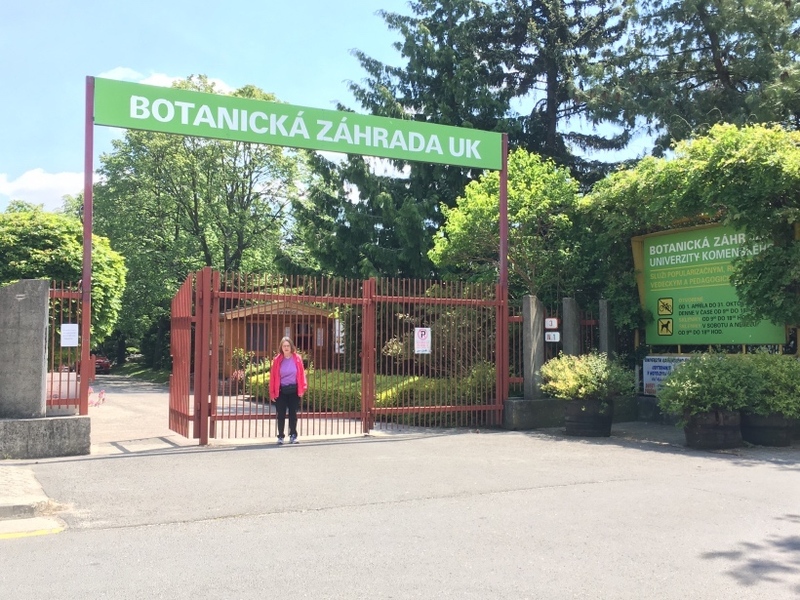 This was a very enjoyable and educational visit to these beautiful countries, Hungary, Slovakia and Czech Republic. We flew directly from Houston to Frankfurt, Germany. 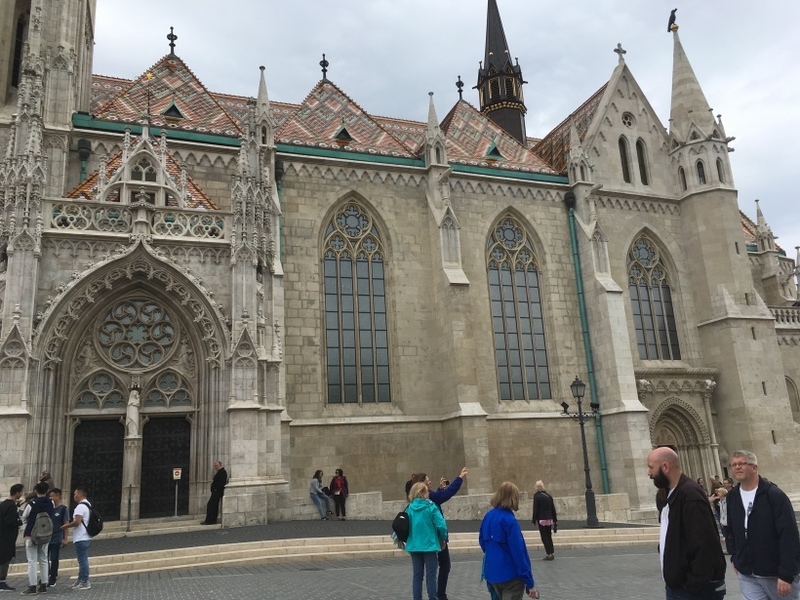 After a short layover, we flew to Budapest. 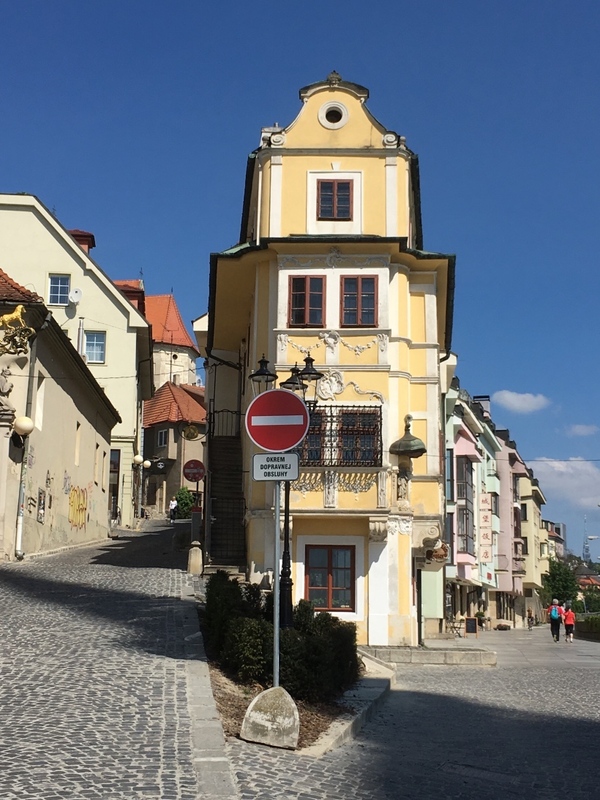 We flew Lufthansa Airlines roundtrip in their Premium Economy class and it was quite an improvement over regular Economy. We did not join a large tour group on this trip, preferring to plan each day ourselves using the internet and our DK Eyewitness guidebooks. It gives us a lot of flexibility to see exactly what we want, on our own timing. 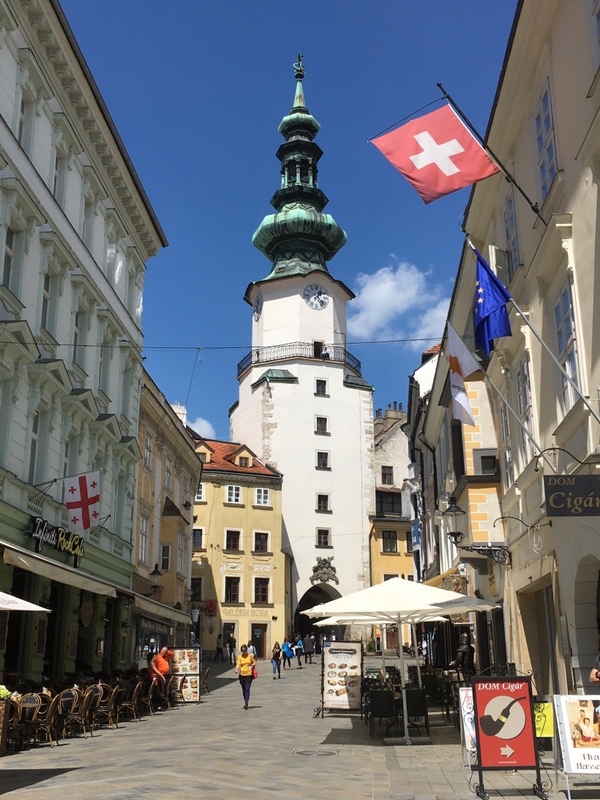 In each of the 3 cities we stayed, we arranged a city walking tour with a local guide the first day after our arrival, to acquaint us with the historic portion of each city. On two different occasions, we scheduled day trips into the countryside to popular tourist areas. We used the Viator app to schedule these and they all worked out excellent. We used the mass transit systems (trams, subways and busses) in each city to facilitate our exploration. We used the outstanding high speed railway systems to move between major cities. 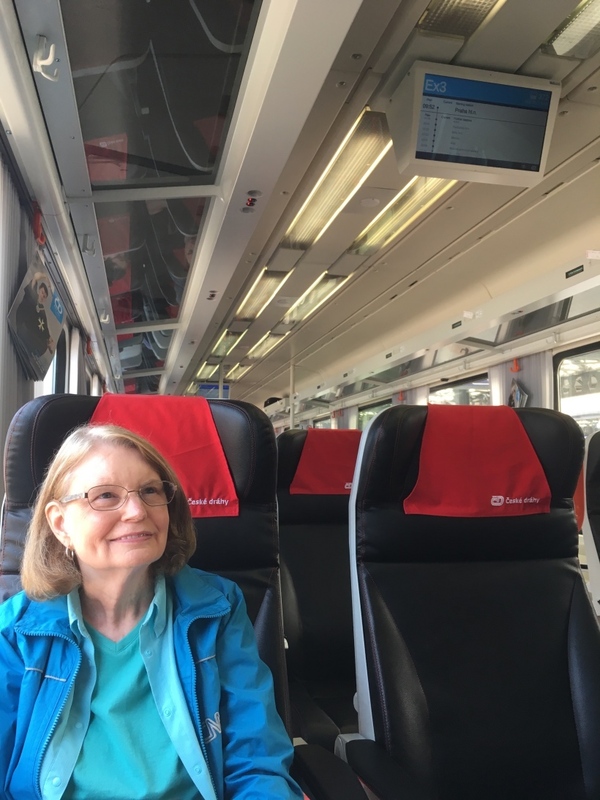 We really enjoy the ease, comfort, and quality of the European rail system. We hope you enjoy our story as much as we did in experiencing it. 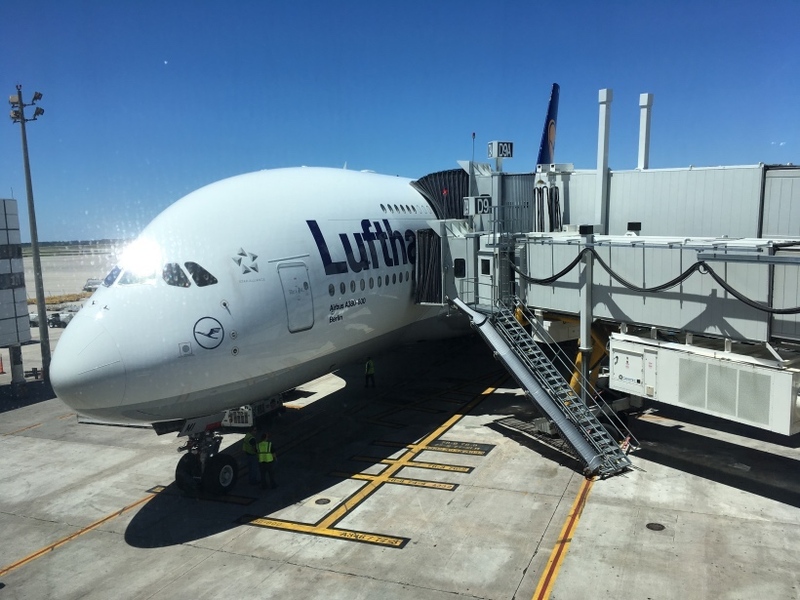 [Monday, May 01] We flew on Lufthansa flight LH441, an A380-800 from Houston IAH at 15:58 to Frankfurt FRA. It was a nice smooth ride and we liked the Premium Economy seats and service. < Our Lufthansa A380-800 ready to depart IAH. 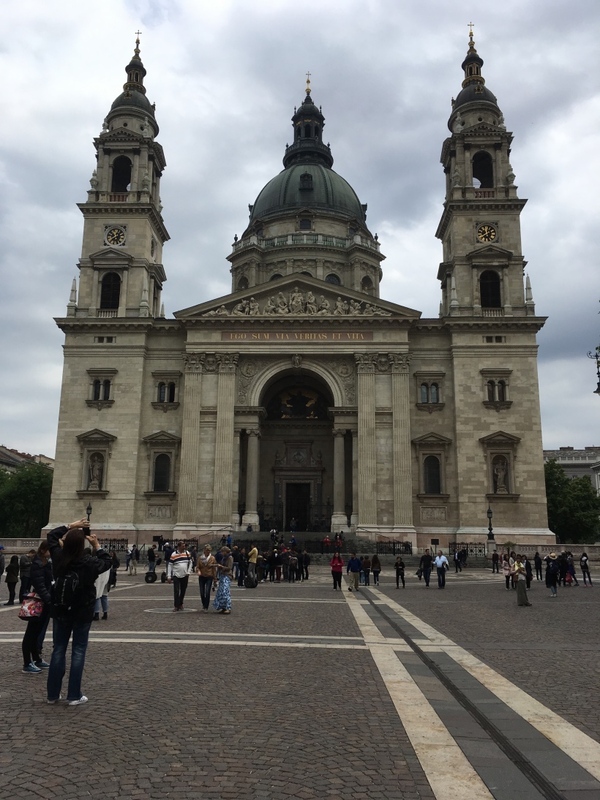 [Tuesday, May 02] Our flight from Frankfurt to Budapest was on a Lufthansa A321 and was a regular Economy service, but was comfortable. We arrived at 13:45 local time in Budapest BUD. 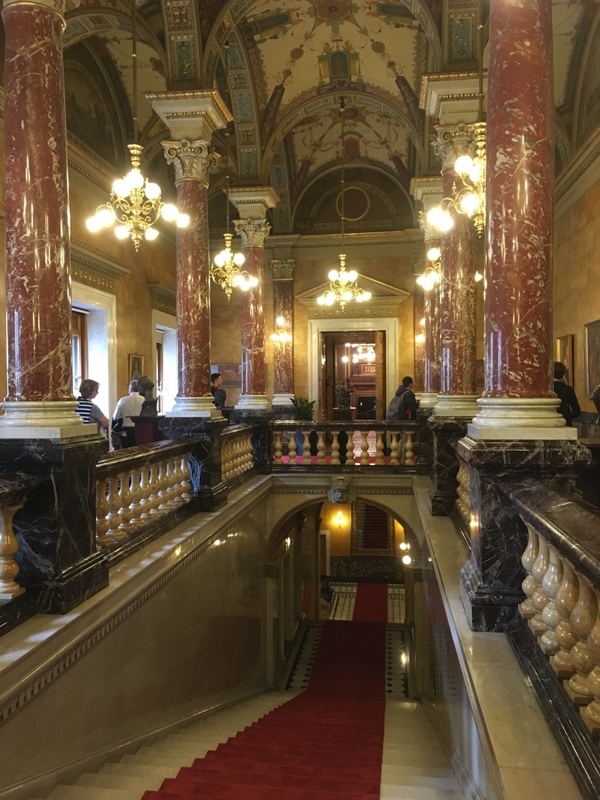 Our driver picked us up at the airport and drove us to our hotel, Hotel Palazzo Zichy, in central Budapest. 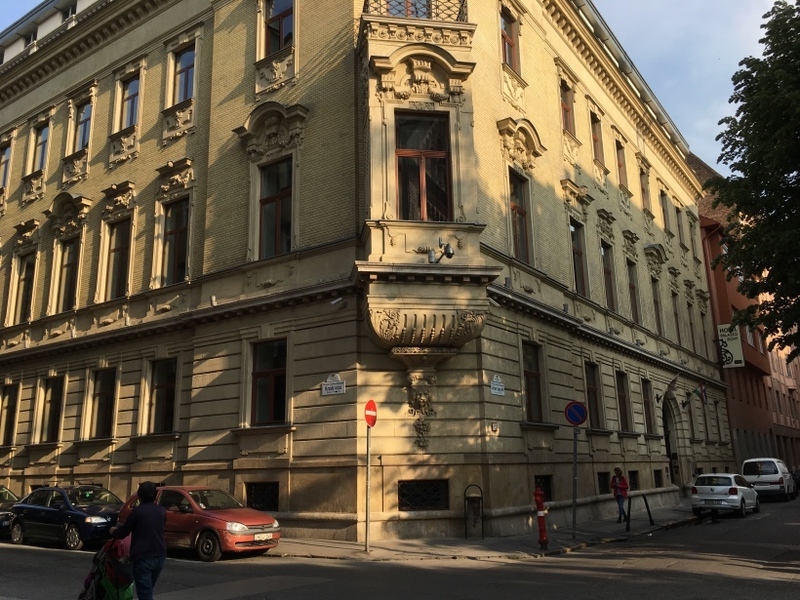 Our hotel was originally built by Count Nandor Zichy and his wife, Countess Livia Zichy from 1897 to 1899 and served as their residence in Pest. In 1948, the Communist government nationalized and divided it into separate residences to be assigned to common people. The heritage listed building was restored and converted into a 4-star hotel between 2007 and 2008 with the assistance of the local government. After getting checked into our room #007, we rode the #9 city bus to where we will take a walking tour Wednesday morning. After riding the bus back to the hotel we went down the street to the grocery store and picked up some of our apple cider vinegar (home remedy for controlling blood sugar). 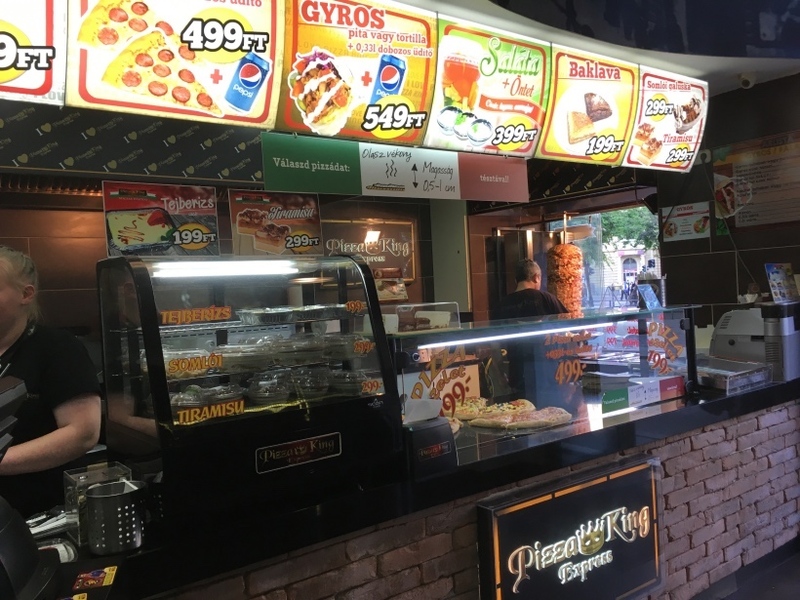 We ate supper at a Turkish restaurant that was close to our hotel, then we walked to the nearby Metro station to check it out. 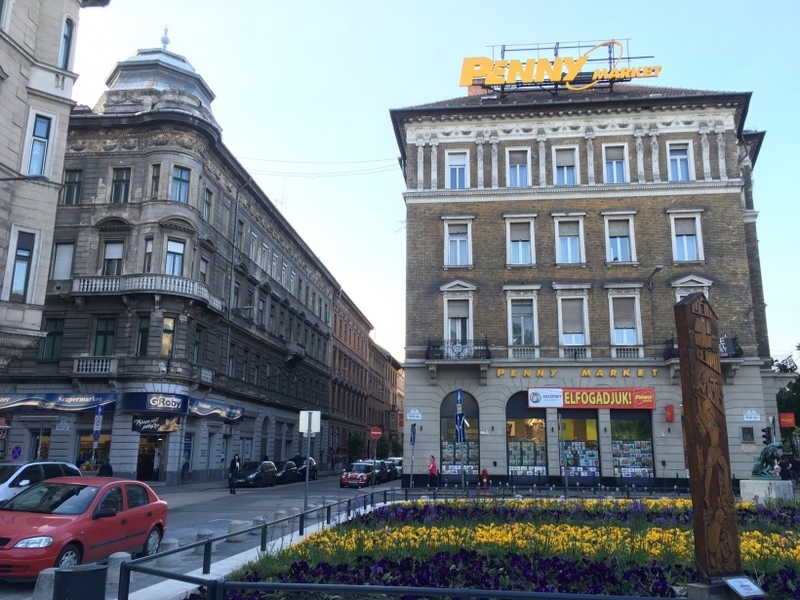 < Our Hotel Palazzo Zichy. 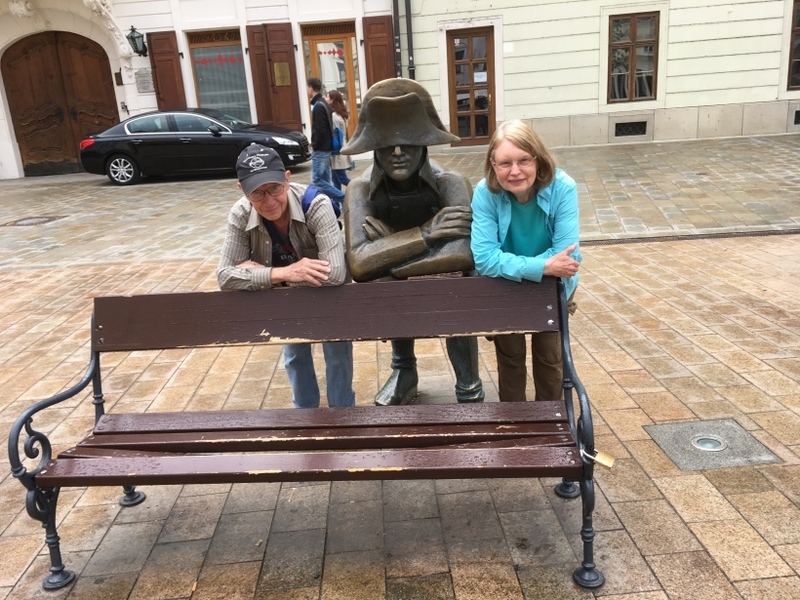 [Wednesday, May 03] This morning we took the Budapest city walking tour. 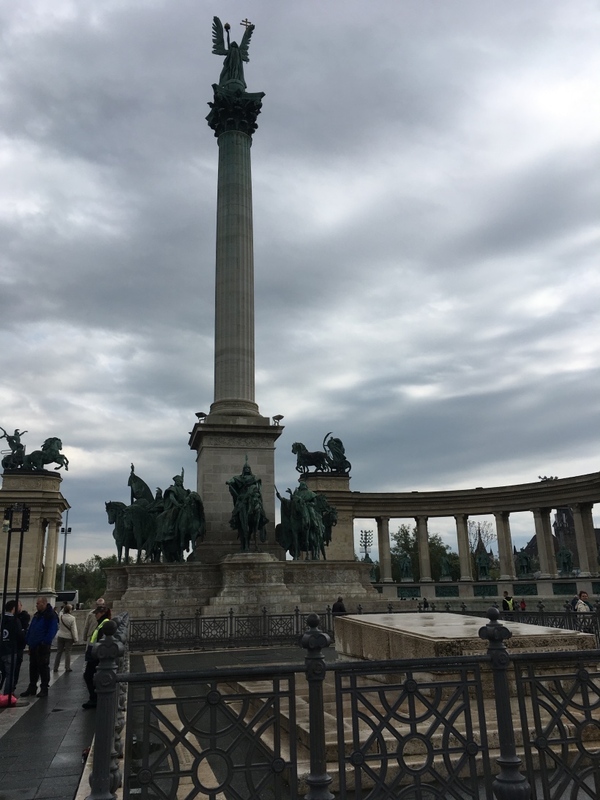 We walked past the Hungarian state opera house, then took the metro subway to Budapest Heroes' Square and saw the monuments of notable Hungarian leaders. 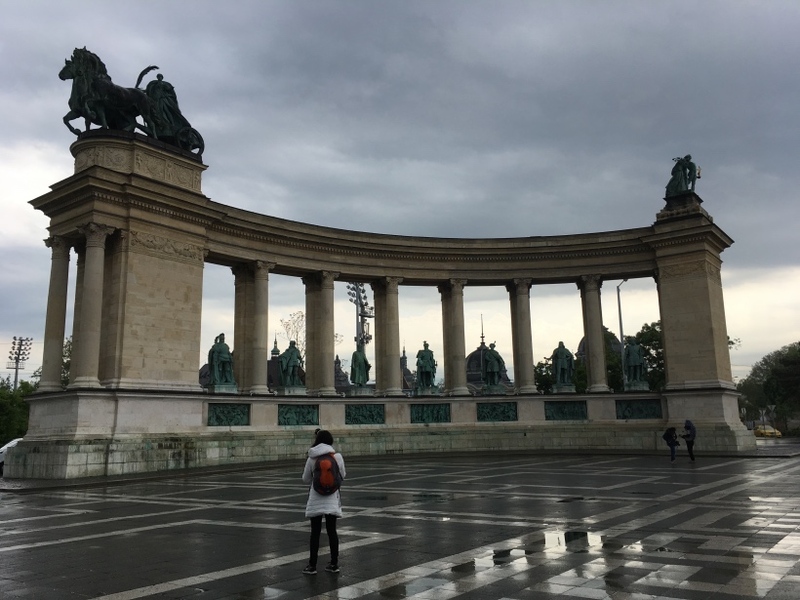 < < Hungarian Heroes' Square. 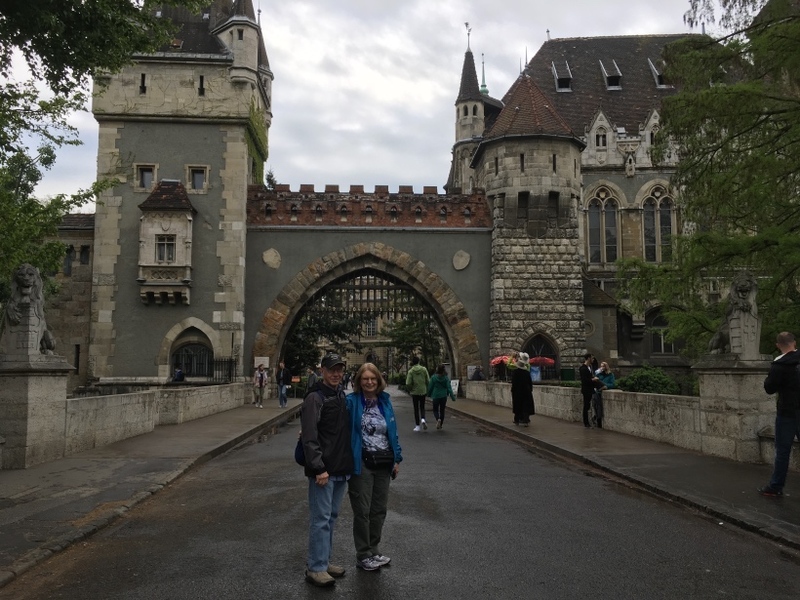 We then walked through the park to Vajdahunyad Castle. This fairytale-like building is not a genuine castle but a complex of buildings, reflecting various architectural styles. < Entrance to Vajdahunyad Castle. < Vajdahunyad Castle. 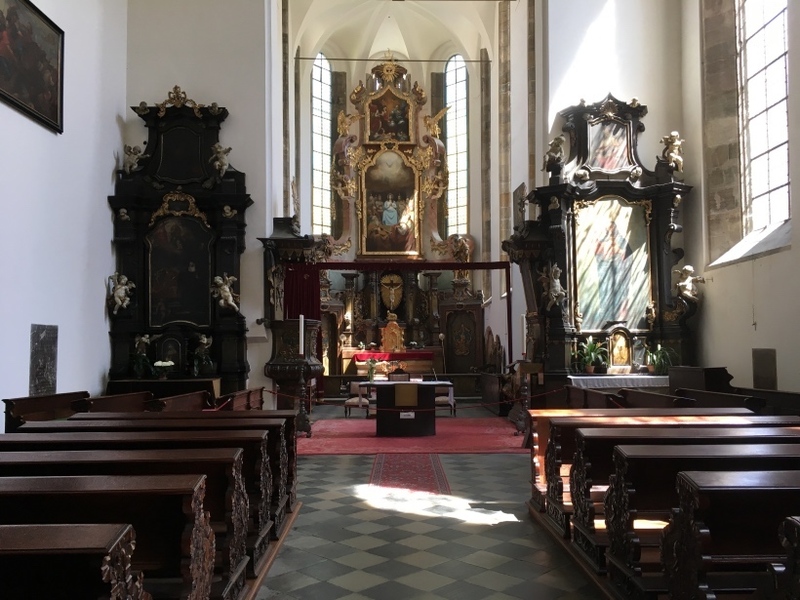 < Jak Chapel. 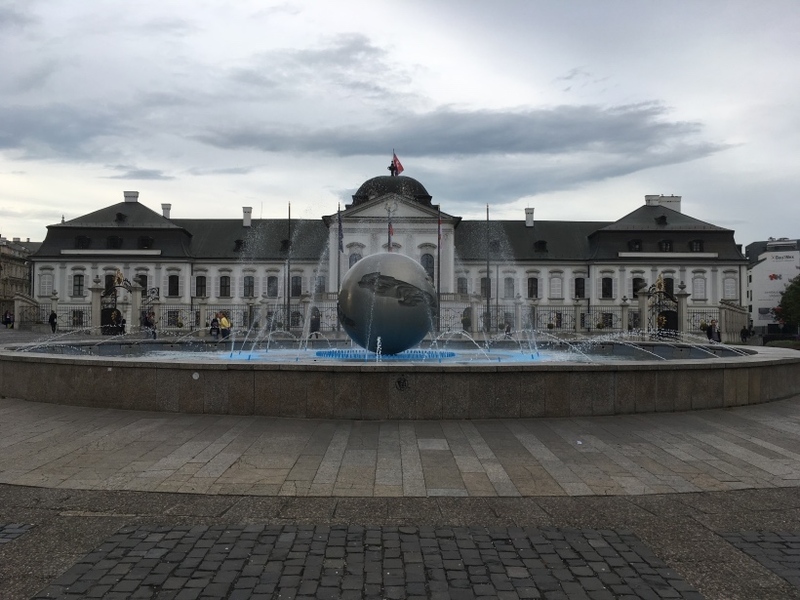 We walked over and saw the Szechenyi Bath from the outside. 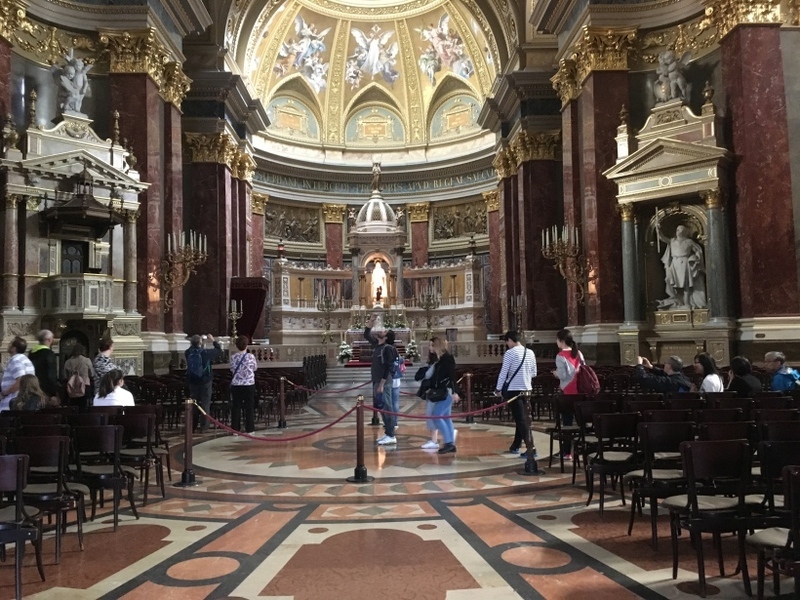 We then walked past Saint Stephen's Basilica and stopped at a nearby restaurant and had a cup of coffee and some Hungarian pastries with our tour group. 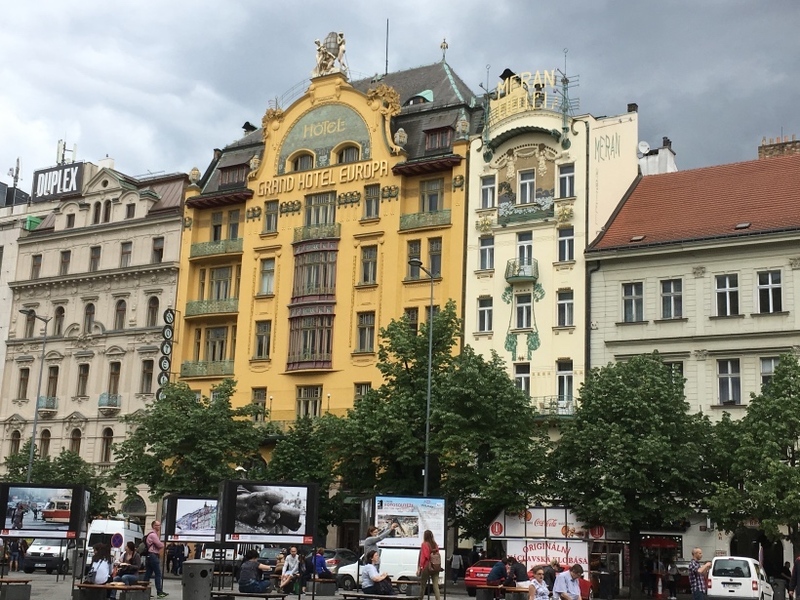 Afterwards we walked to Vaci Street and the Danube Promenade on the Pest side of the Danube River. 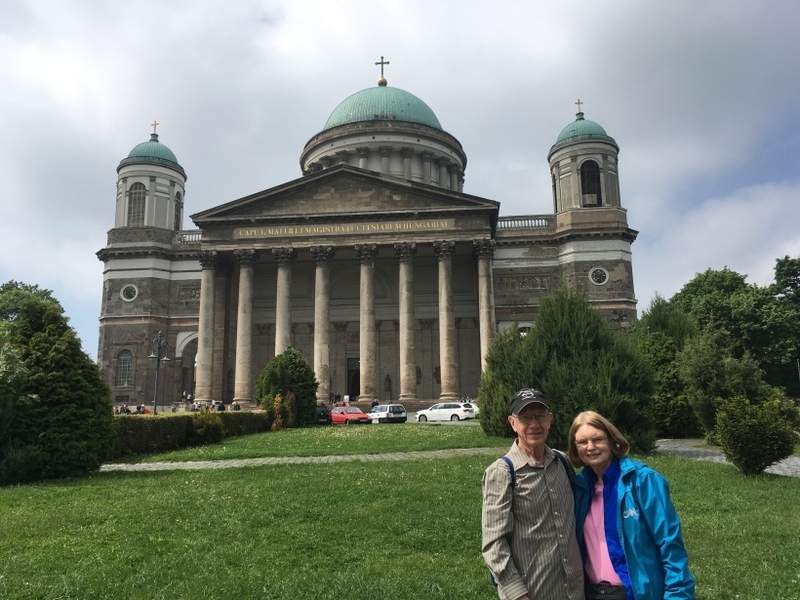 We crossed the Chain Bridge and walked up the very steep hill to the Budapest Castle District to Matyas Church where the tour ended. The Parish Church of Our Lady Mary was built on this site between the 13th and 15th centuries. 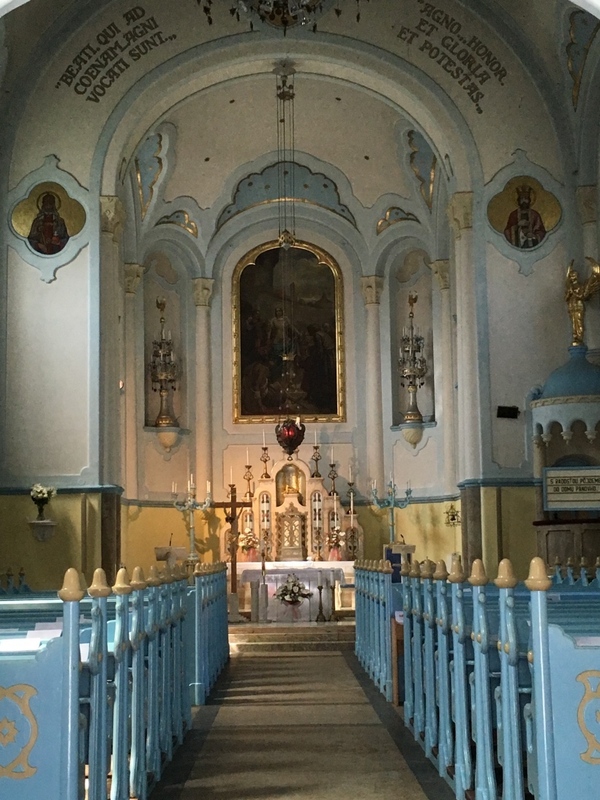 After our formal tour ended, we bought tickets and toured the Matyas Church inside on our own. We then caught the #16 bus back to the Pest side of the river. < < < < Matyas Church. We went back to the hotel via #9 bus. We walked to the Metro and bought a 72 hour Metro pass. We stopped at a Chinese restaurant and ate super. There was some light rain at the start of the tour but it stopped and the rest of the day was nice. [Thursday, May 04] Today we went to the Parliament visitor center and found that it was booked up for the day. 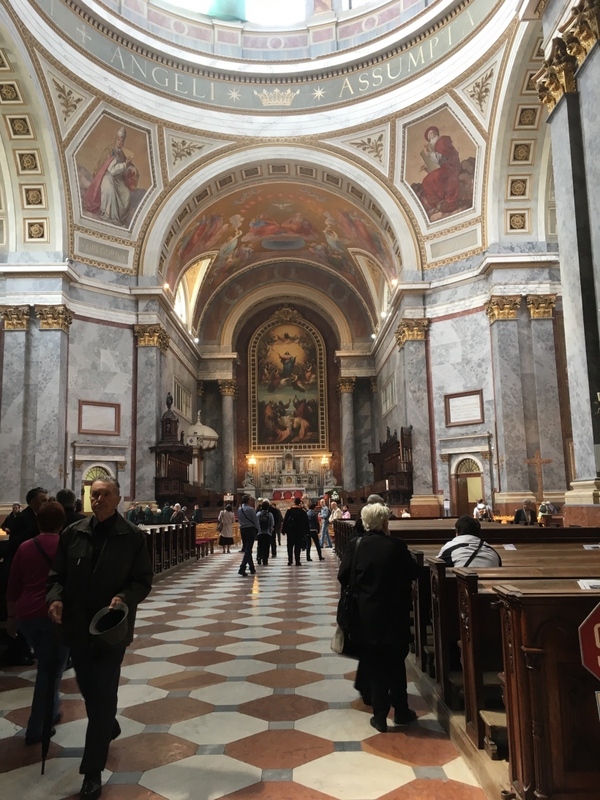 We walked over to the Saint Stephen's Basilica and went inside and toured it. 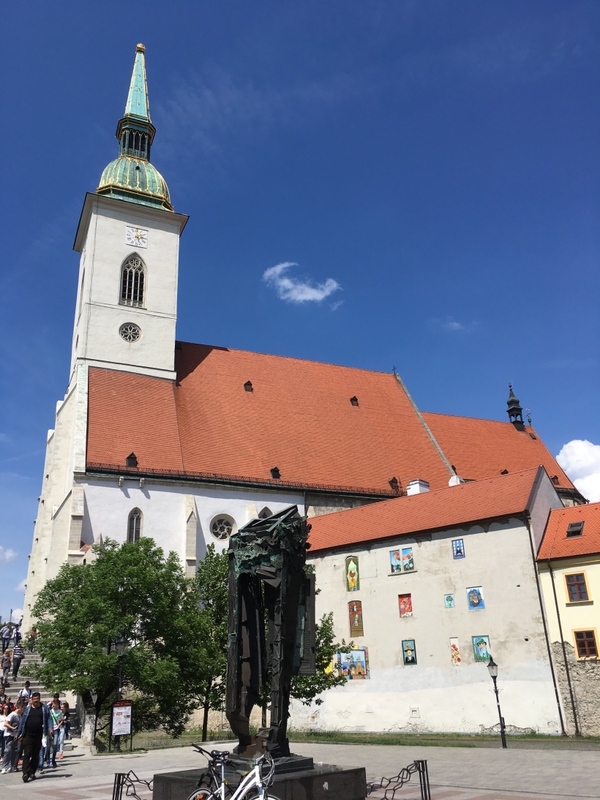 This church is dedicated to St Stephen, or Istvan, the first Hungarian Christian king. 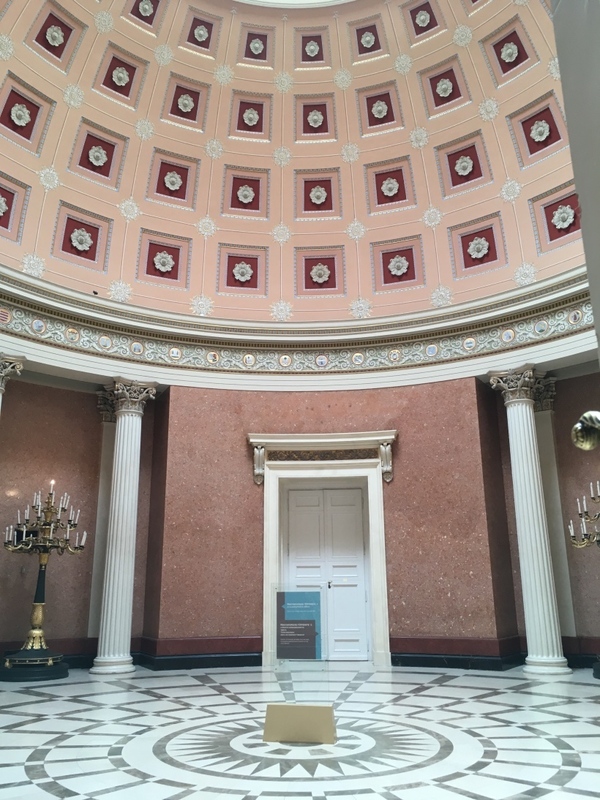 Construction began in 1851 and after a dome collapse in 1868, was completed in 1905. 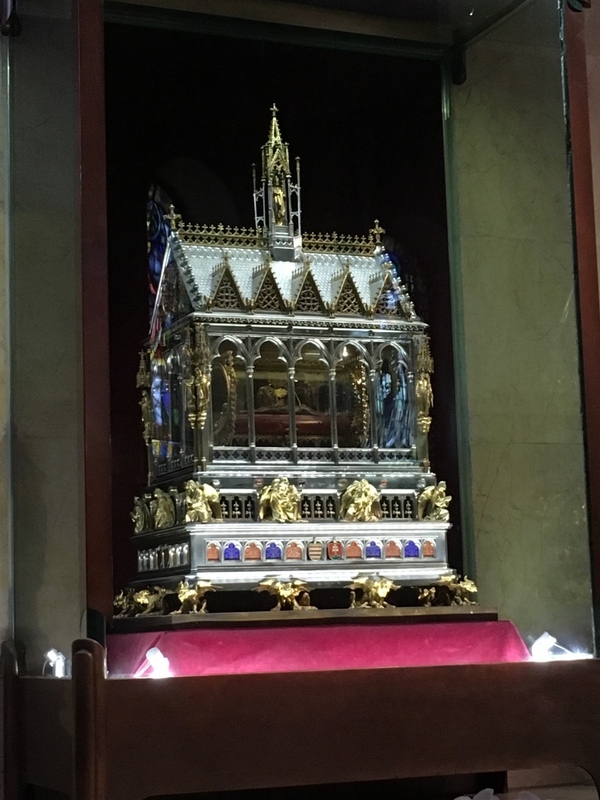 Contained therein is Hungary's most unusual relic, the supposed mummified forearm of St Stephen. It is kept in the Chapel of the Holy Right Hand. King Stephen died in 1038 and he was canonized in 1083. His right hand, found intact, has been highly esteemed by the nation ever since. < < St Stephen's Basilica. < St Stephen's hand. Afterwards we rode a subway out on the outskirts of the city just to see how the suburbs looked. We road it back to a Costa Coffee restaurant where we enjoyed coffee and a snack. 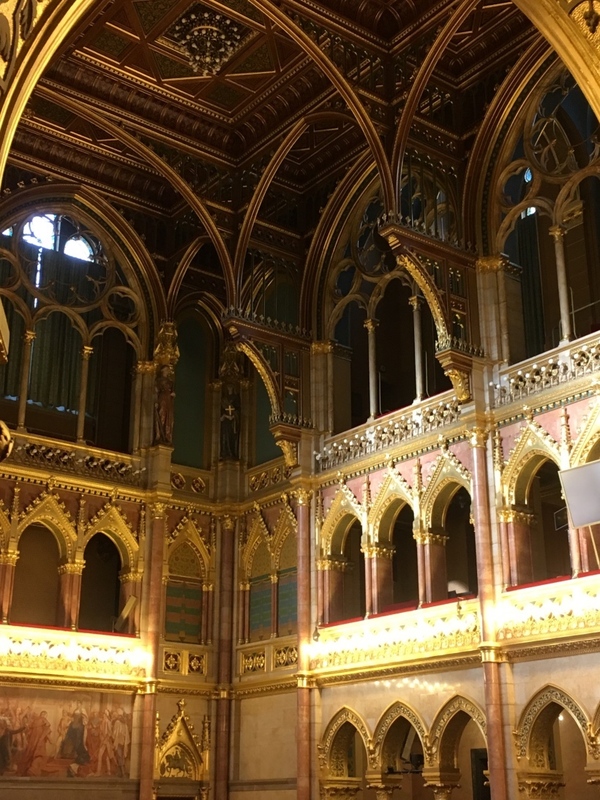 In the afternoon we took the Hidden Budapest Walking Tour with Absolute Tour Center. 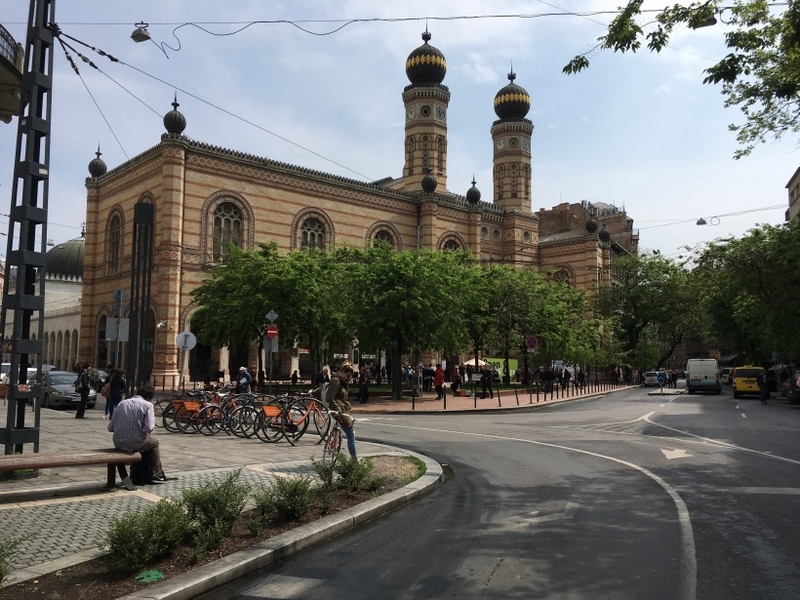 We walked through the Jewish Quarter, home of one of Europe's oldest synagogues, and heard stories of the Jewish communities turbulent history. We went through Gozsdu courtyard and saw an array of shops and bars housed in formally derelict buildings and favored by locals. 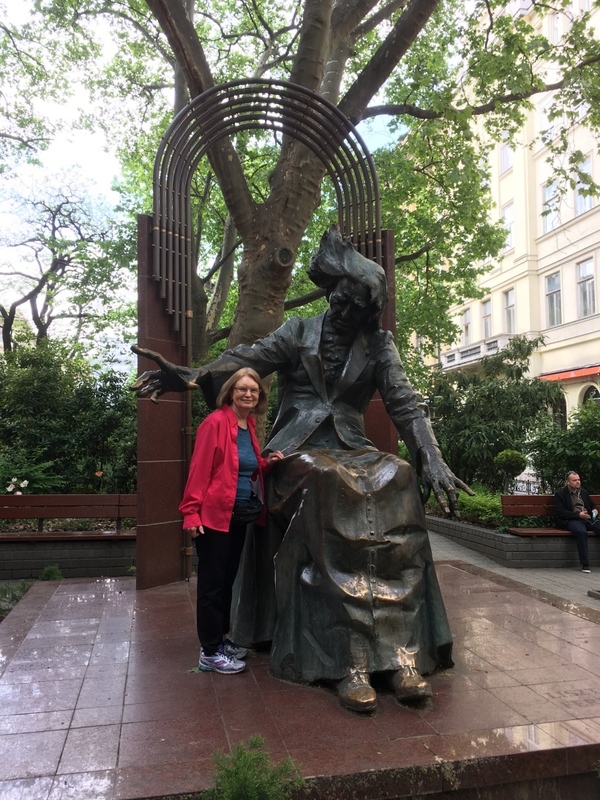 We walked through Franz Liszt Square and saw a statue in his honor. 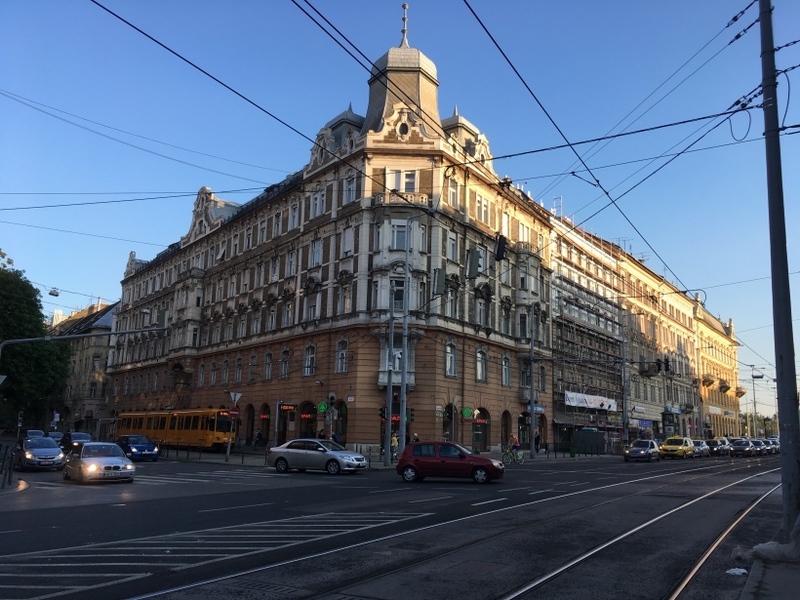 We delved into the history of the Soviet uprising in the Palace Quarter and then we concluded our tour near Central Market Hall after three hours. 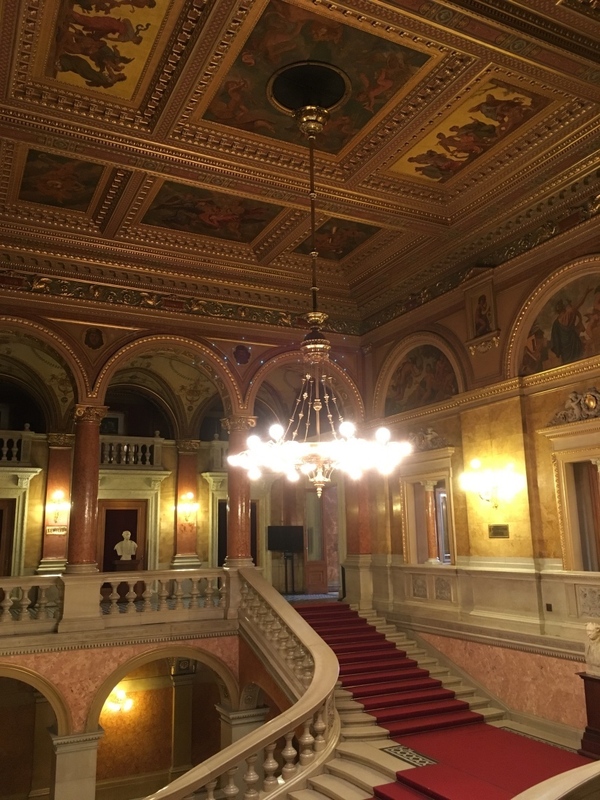 < Budapest Operetta-Theater. < Franz Liszt statue. After the tour ended, we walked back to our hotel, then down the street to a Pizza King Express and ate a slice of pizza. 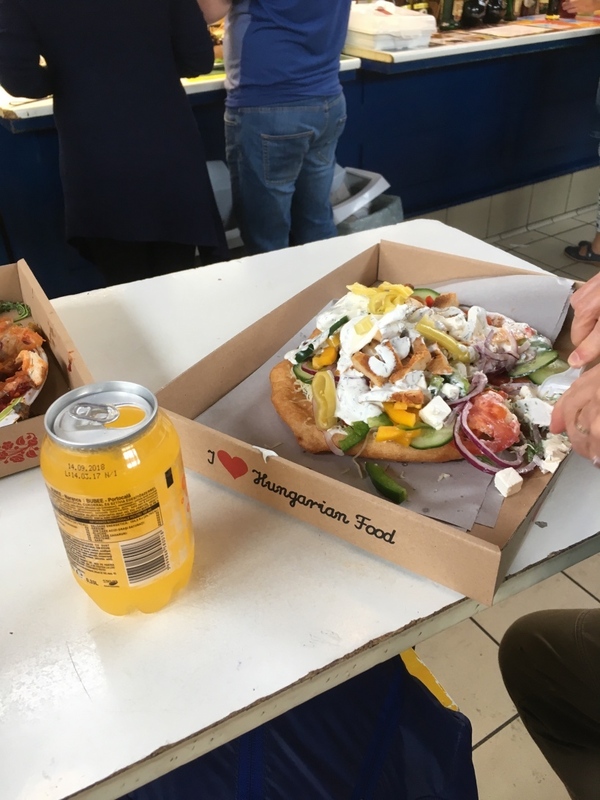 Pizza seems to be a popular food in Budapest. 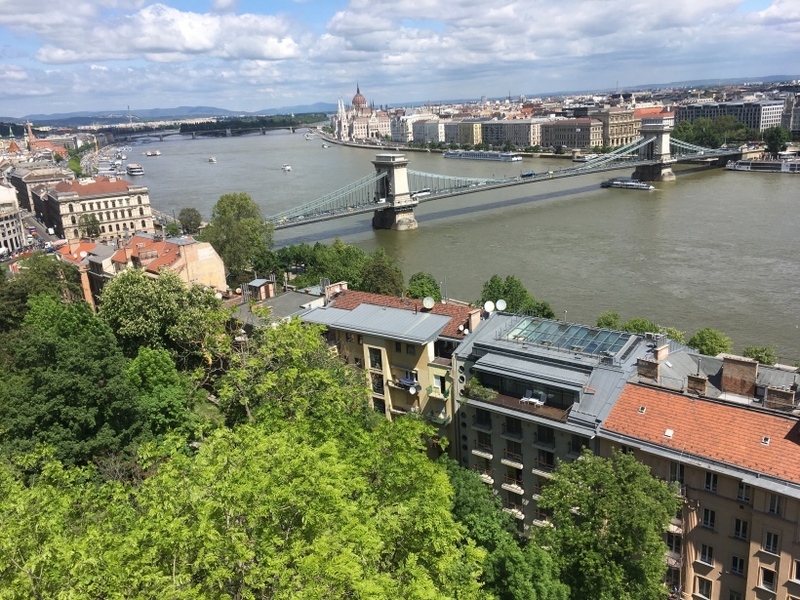 We then rode the trolley across the Danube River to the Buda side. We returned to our hotel via the trolley. It was an 8 mile day according to our fitbits. < Two buildings near our hotel with grocery stores. < Trolley we rode. < Interesting buildings. 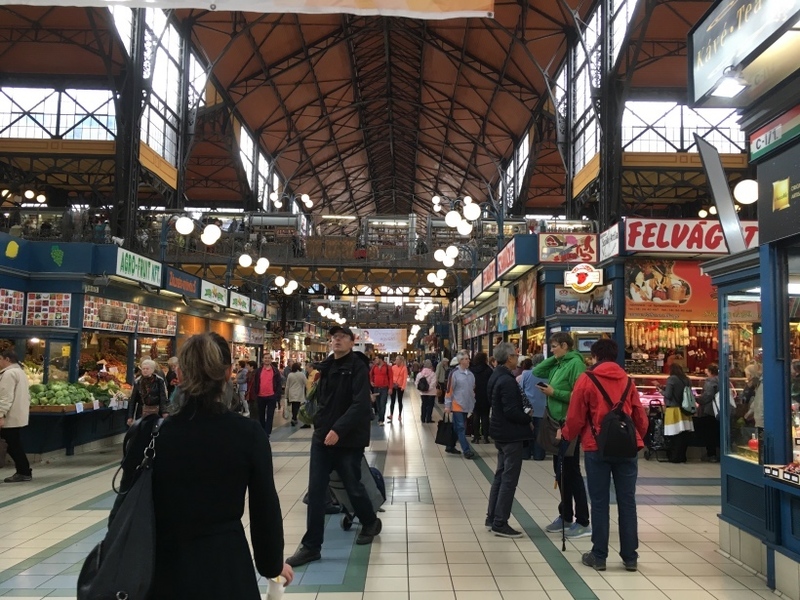 [Friday, May 05] Today we first went to the Central Market Hall again, where we spent several hours walking through the extremely large and diverse variety of goods that are for sale. 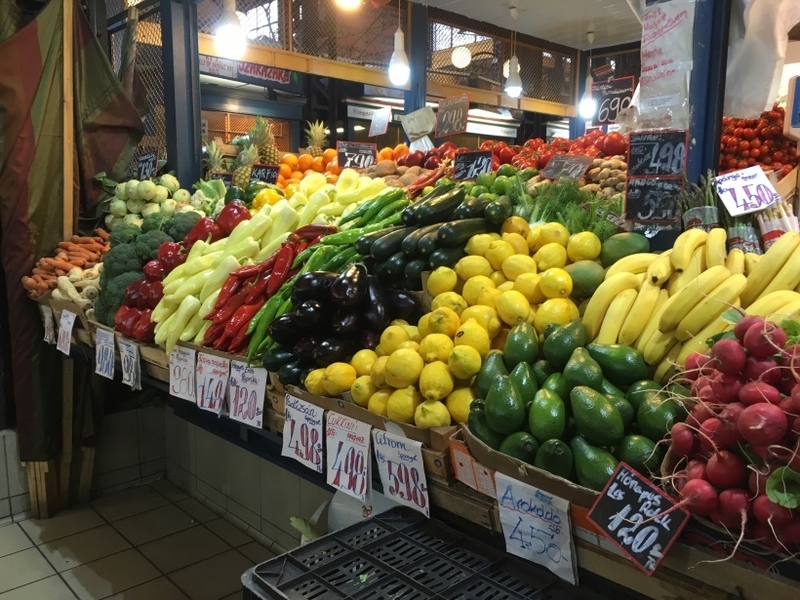 The produce was especially fresh looking. Too bad we didn't have a kitchen. < < < < Central Market Hall. 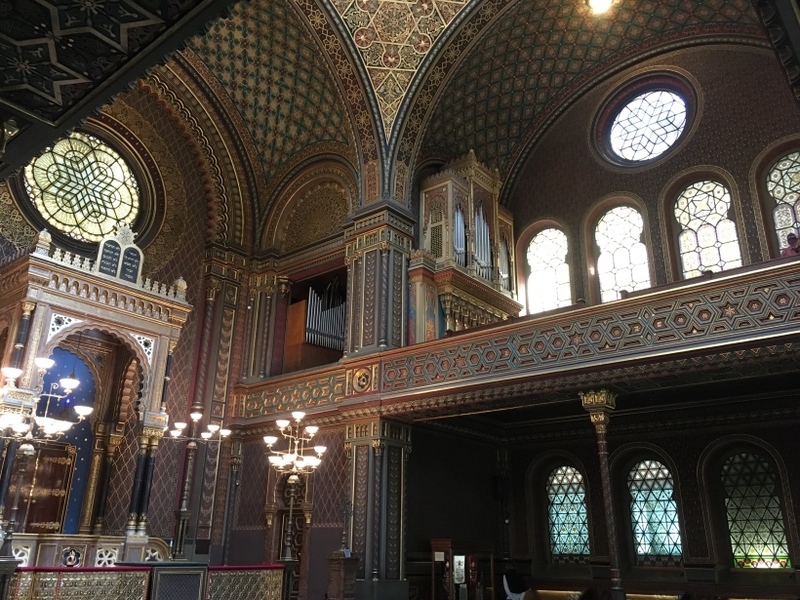 Next we went to The Great Jewish Synagogue in Budapest, which is the largest synagogue in Europe. 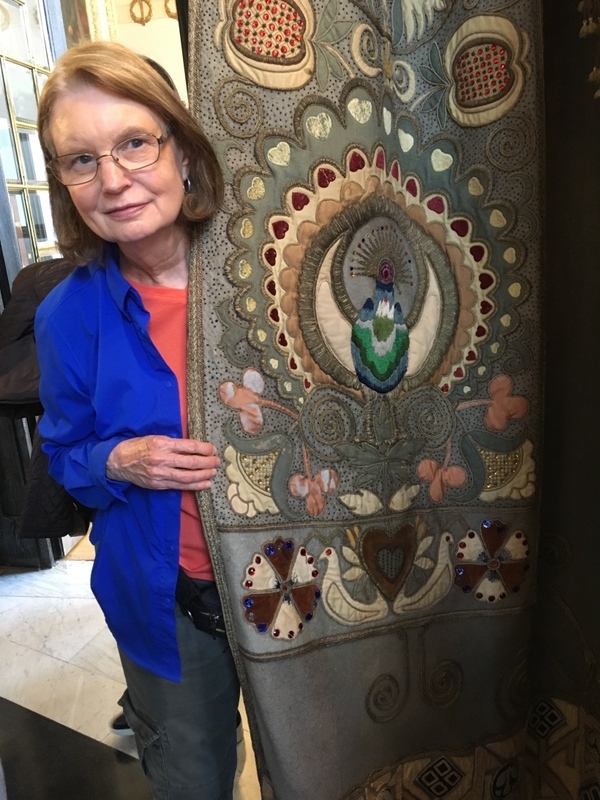 We took a guided tour of the synagogue. 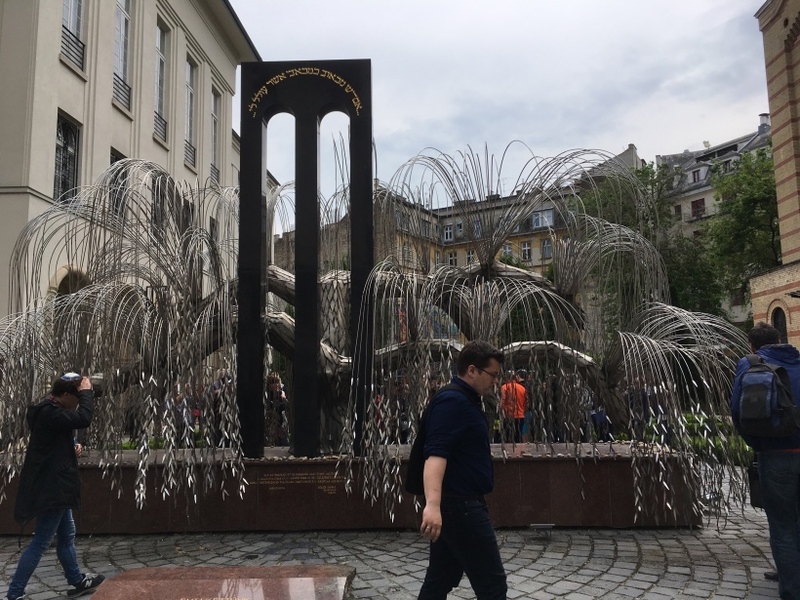 It was a very sobering experience to hear the story of what happened in the Jewish Quarter near the end of WWII, when the Nazis tried to eliminate the Jewish population. 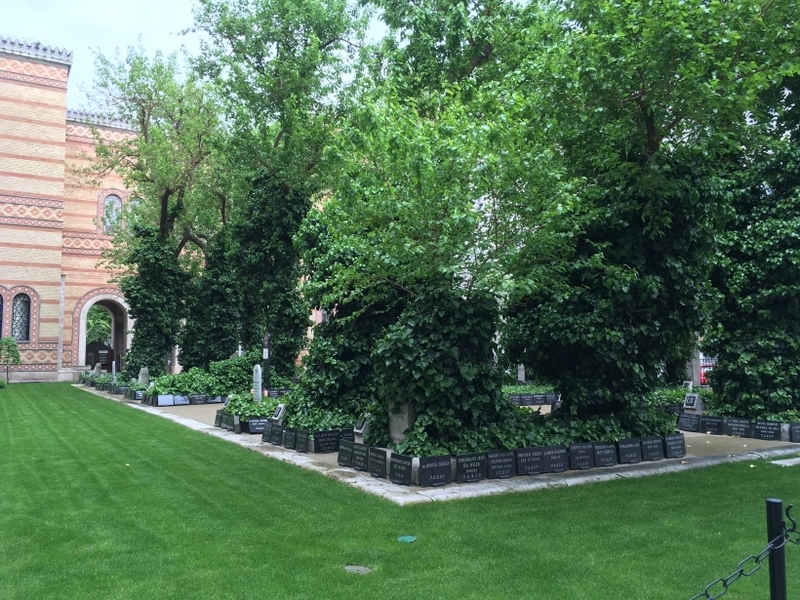 Mass graves are contained within the synagogue walls and marked with large areas of vegetation. 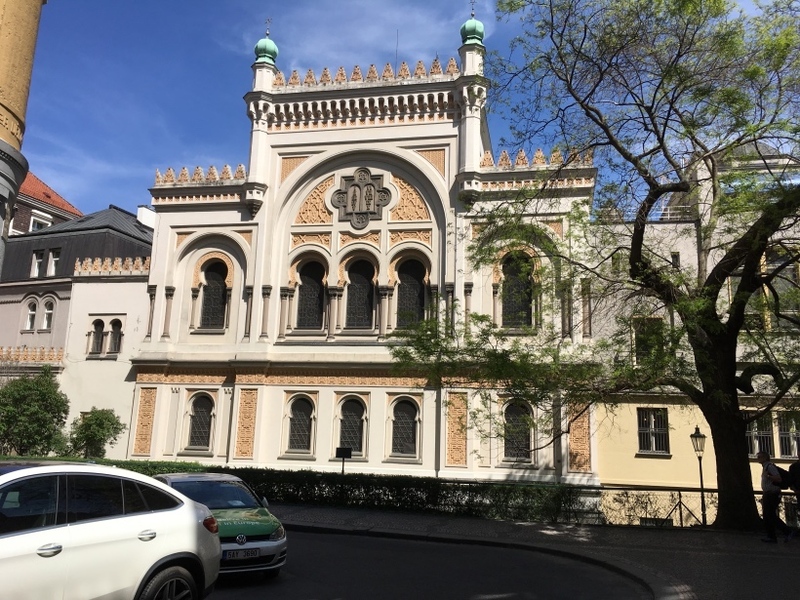 < < < The Great Jewish Synagogue. < Tree of remembrance. < Mass graves. 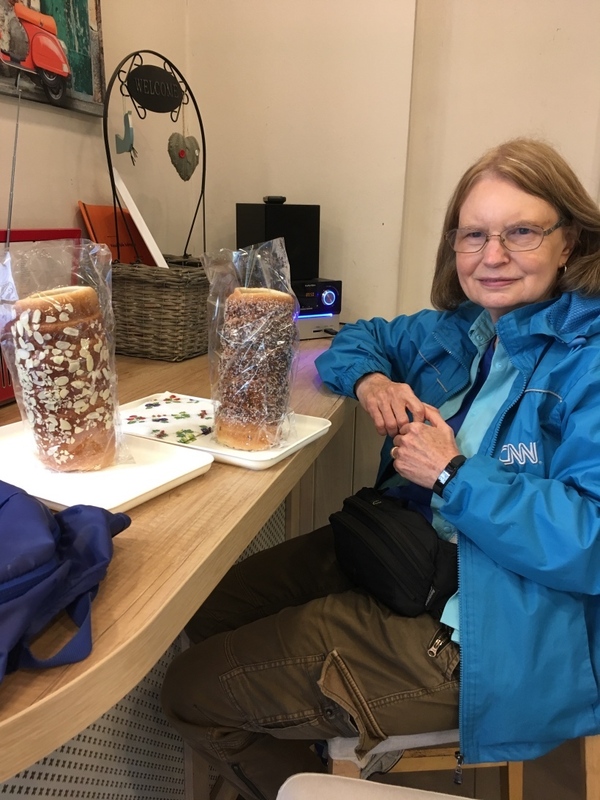 We were finished by about 1:30, then we stopped and ate a chimney cake at a nearby stand. 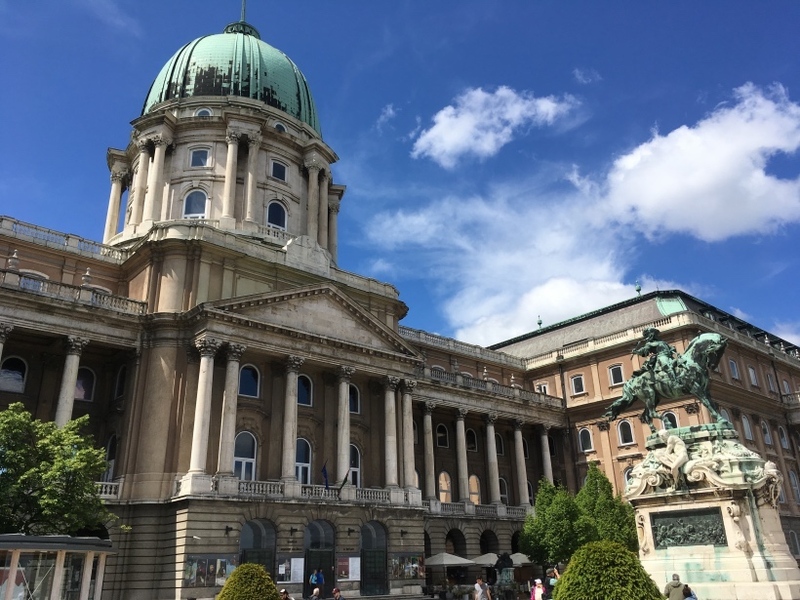 We then spent several hours inside the Hungarian National Museum. 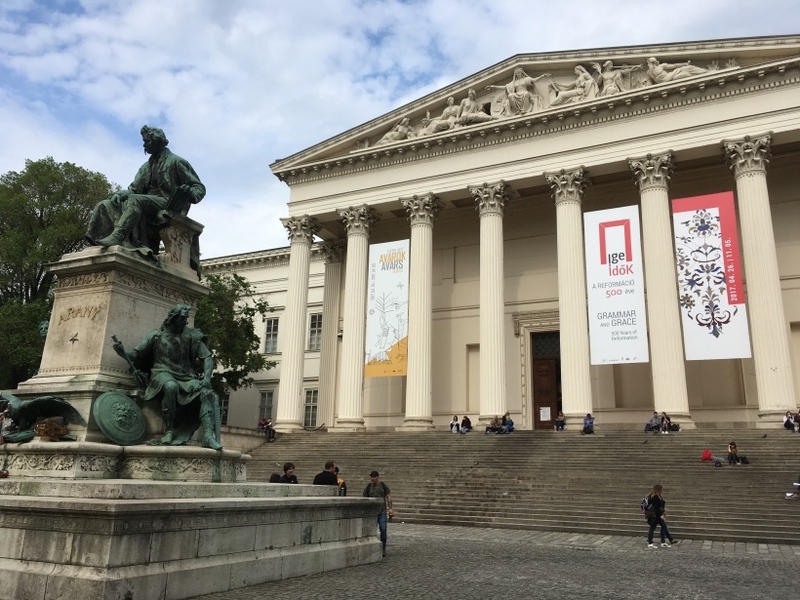 The museum was founded in 1802 and is the country's richest resource of art and artifacts relating to its turbulent history. < < Hungarian National Museum. 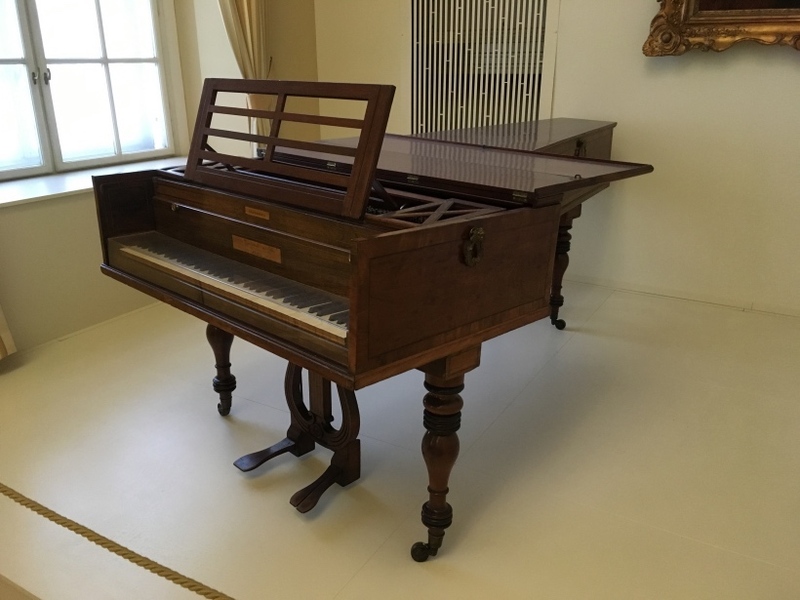 < Broadwood piano once belonging to Beethoven and Liszt. 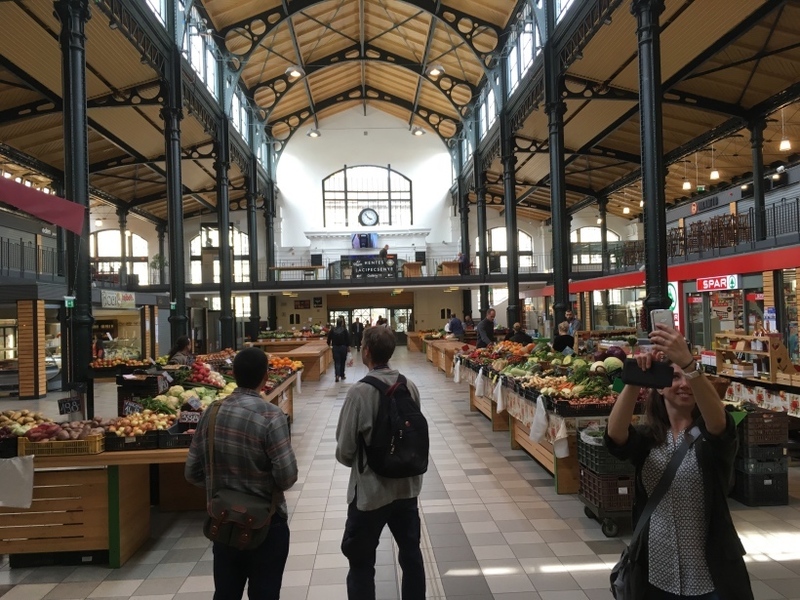 Afterwards we went to Central Market Hall again and ate a Lango. 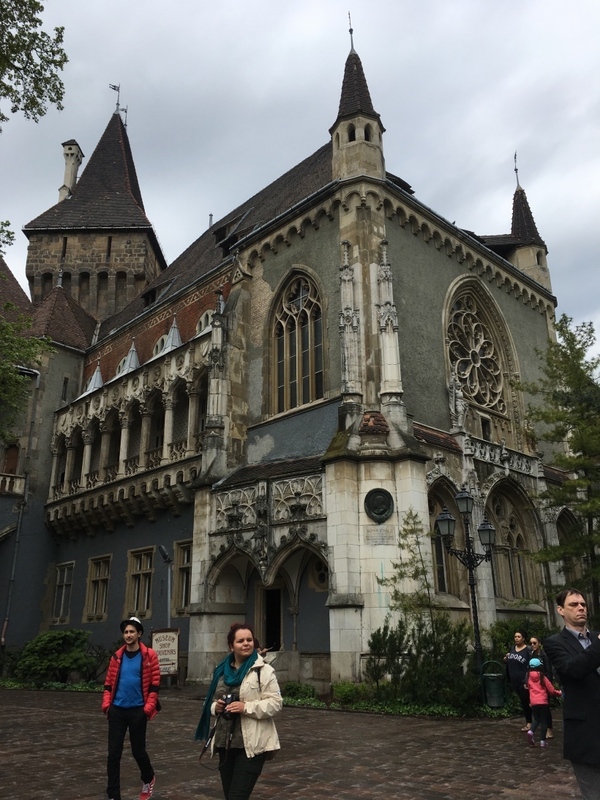 [Saturday, May 06] Today we took a full day private tour of the Danube Bend Area north of Budapest. 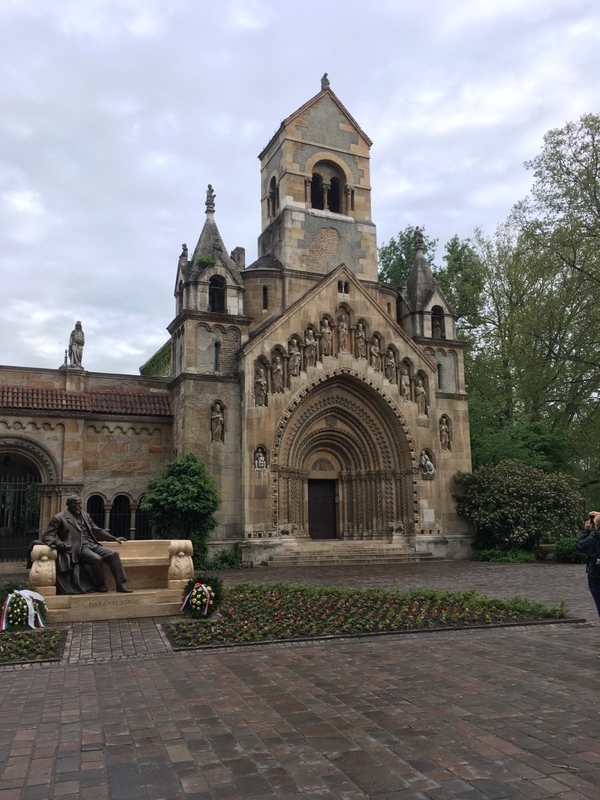 We visited the towns of Esztergom, Visegrad and Szentendre with our guide, Susan. 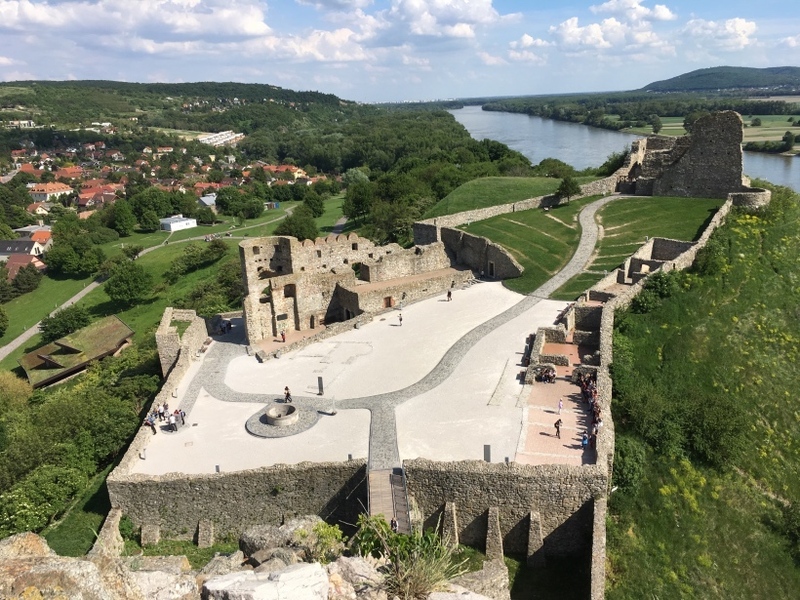 We rode by her car and enjoyed a 3-course lunch at Visegrad, in view of the spectacular ruined Citadel and the Danube River. The Citadel was built in the 13th century, but was destroyed later. 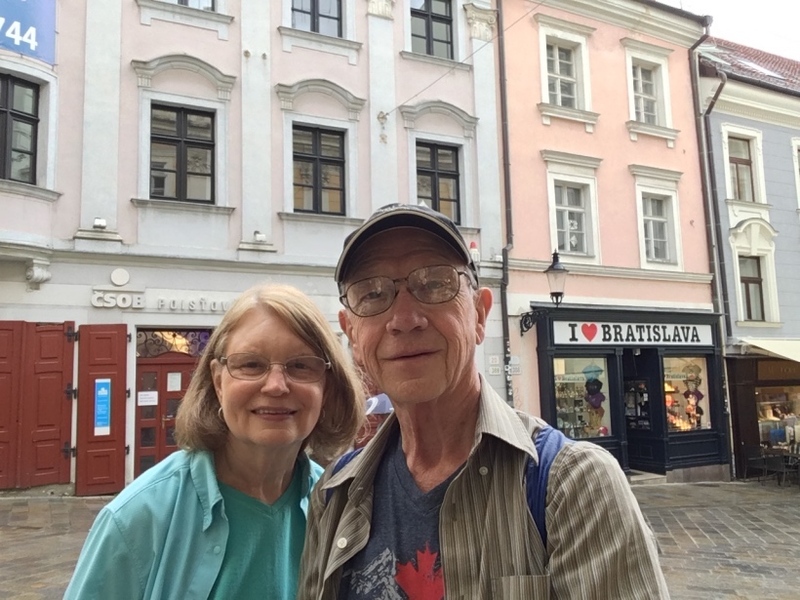 After a stroll through the streets of Szentendre, our guide took us to a cruise boat and we rode it down the Danube River back to Budapest, where our guide met us and took us to our hotel. It was a very enjoyable day. 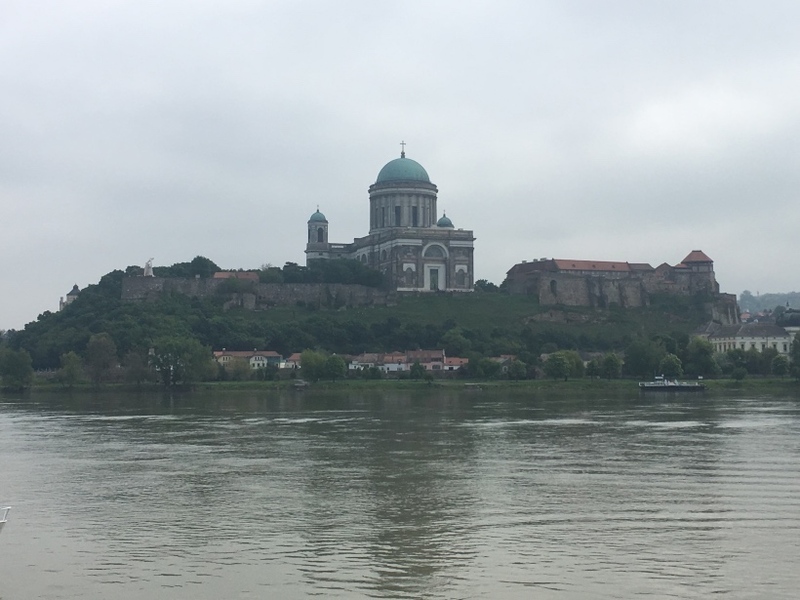 < Looking across the Danube River from Slovakia into Esztergom, Hungary and The Basilica of Esztergom. 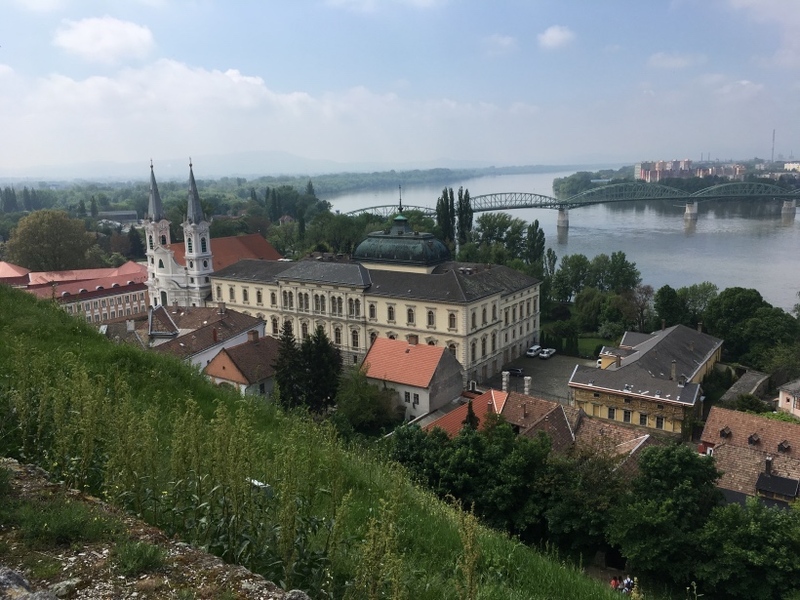 < Overlooking Esztergom and the Danube from the basilica. 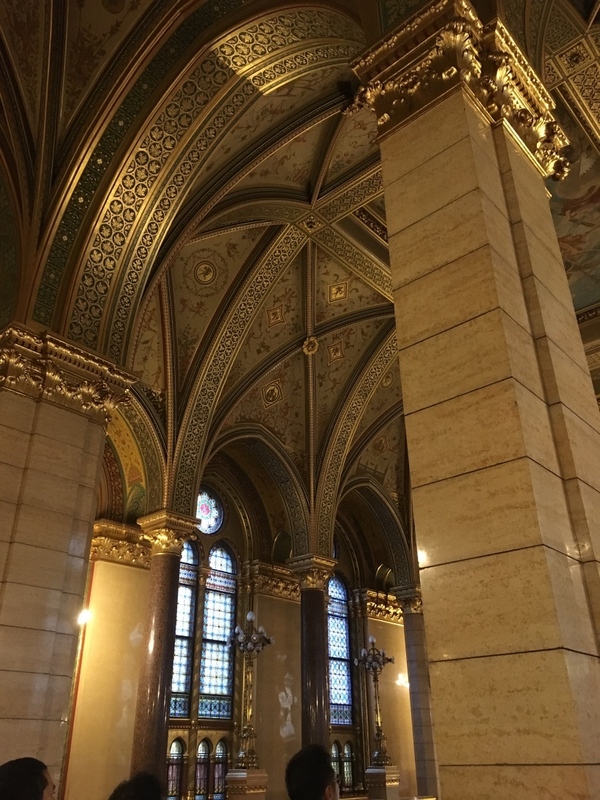 < < < Basilica of Esztergom. 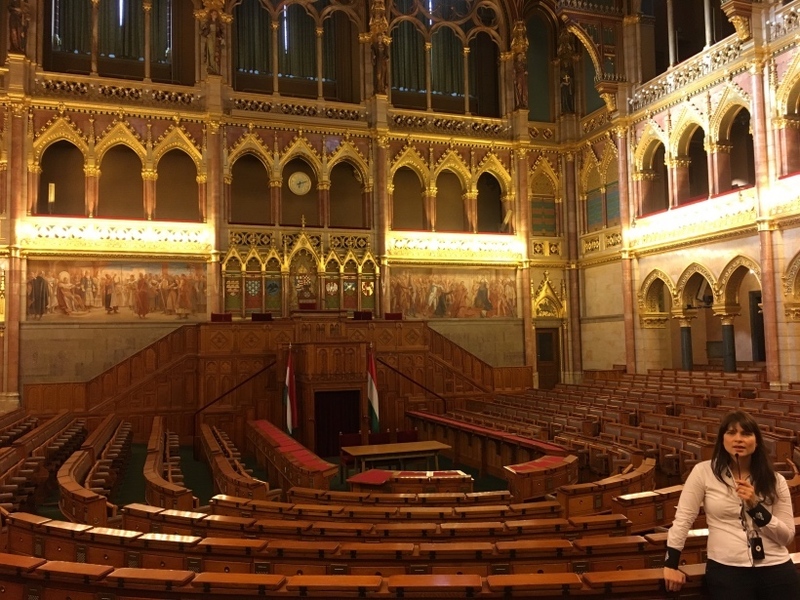 < The Hungarian Parlament from our cruise boat. [Sunday, May 07] This morning we went to the nearby metro station and purchased another three day metro pass. 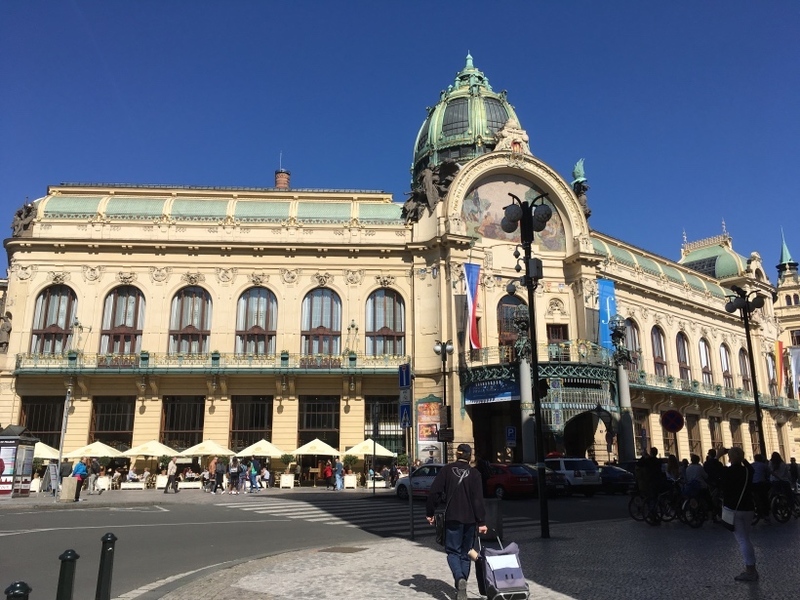 We then rode the subway to the Keleti Railway Station and purchased our train tickets for our Tuesday morning ride to Prague. 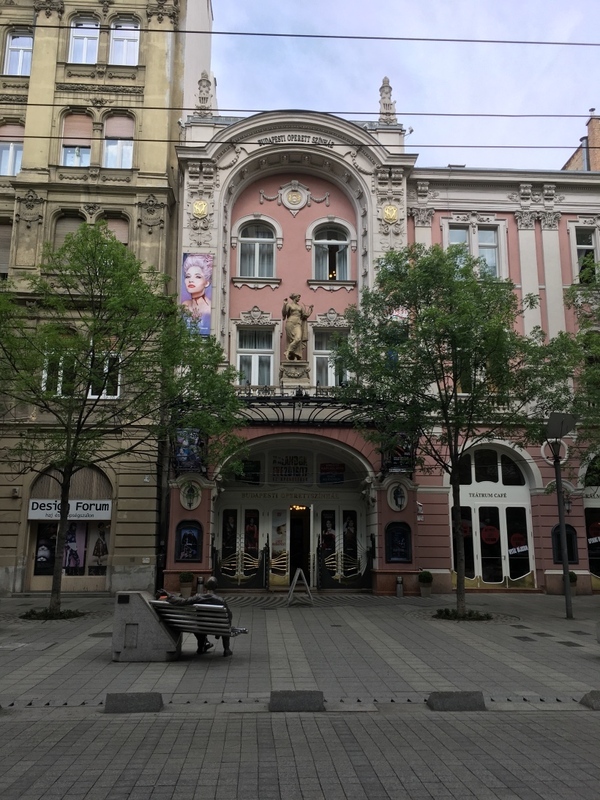 We then went to Duna Palota Theater and picked up our tickets for a Hungarian Folk Show tonight. 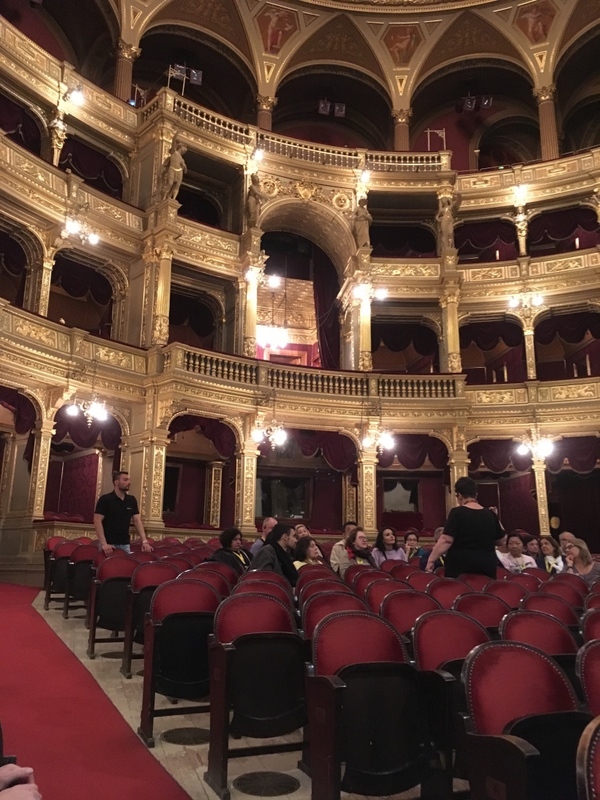 After stopping at Costa Coffee for a snack and coffee, we walked to the Hungarian Opera, where we took a guided tour of the theater. After the tour, we ate supper in the opera's restaurant. 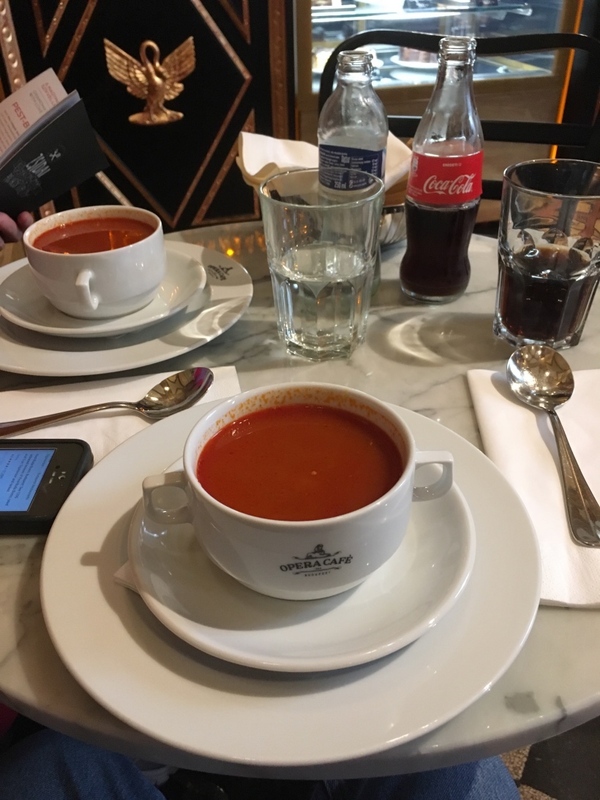 We had Hungarian Goulash Soup. 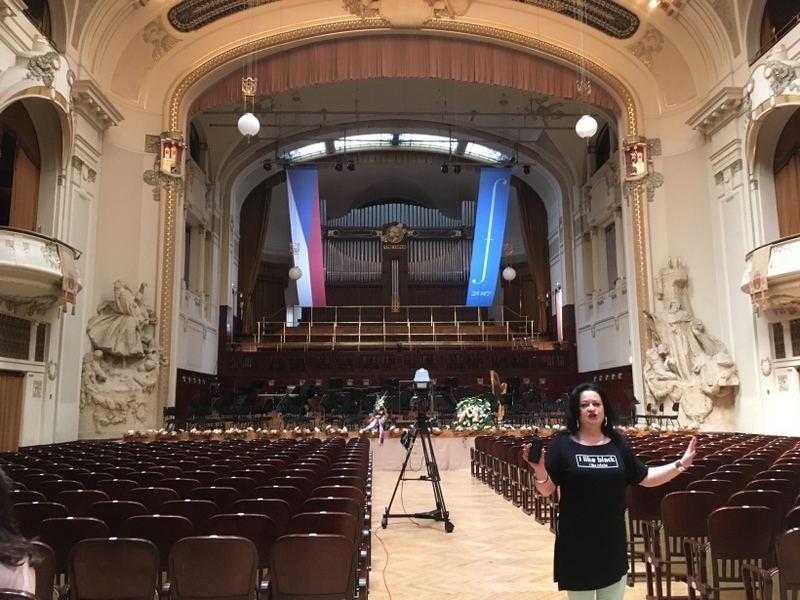 < < < Hungarian Opera Theater. < Our Hungarian Goulash Soup. 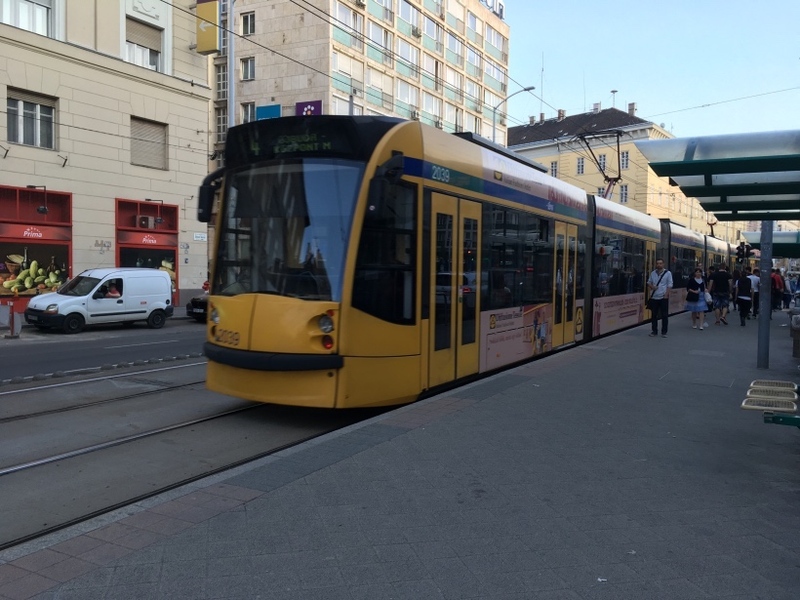 We then rode the trolley to the end of the line on the Buda side of the Danube, then back to the hotel. With the time difference between Budapest and Houston, we were able to watch some of the Sunday morning Second Baptist Church 11:11 service streaming on our iPad. The quality was very good. 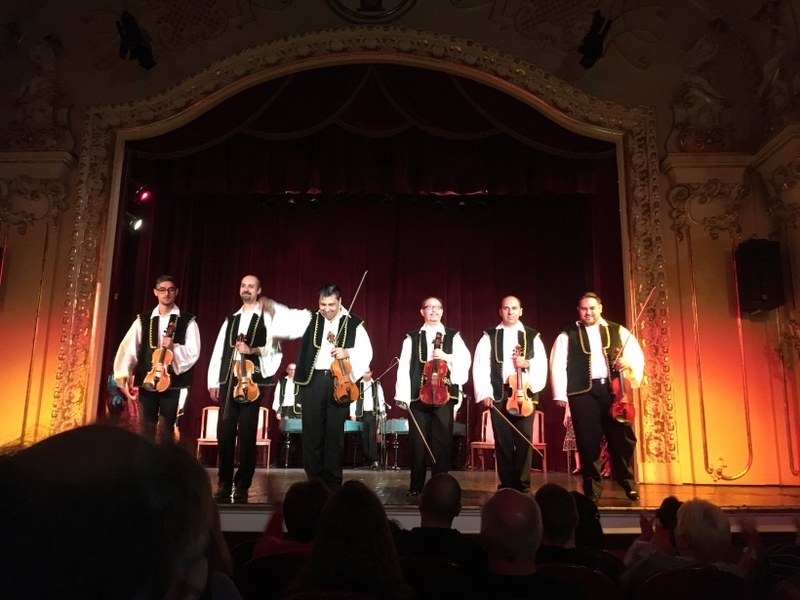 We rode the #9 bus to see the Hungarian Folk Show at the Duna Palota Theater. The show was very entertaining. 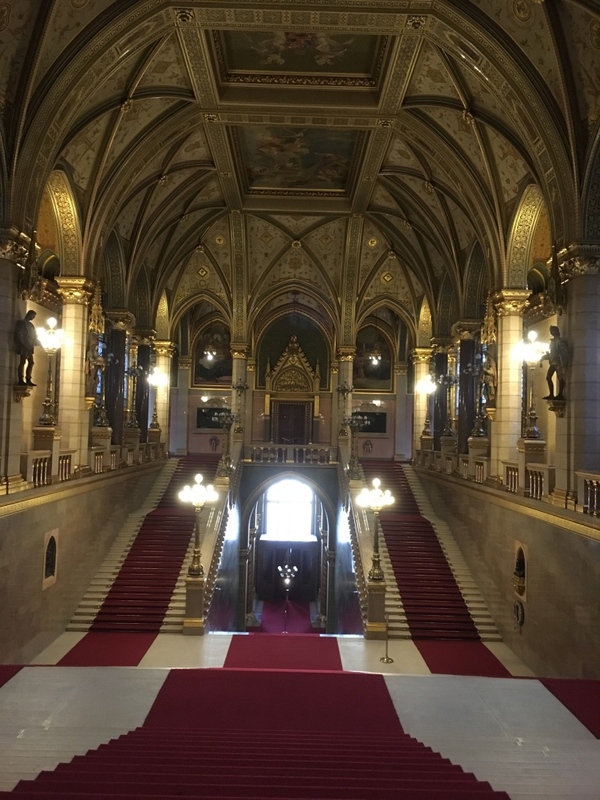 [Monday, May 08] We took the trolley to the Hungarian Parliament and purchased tickets for the 17:30 tour. 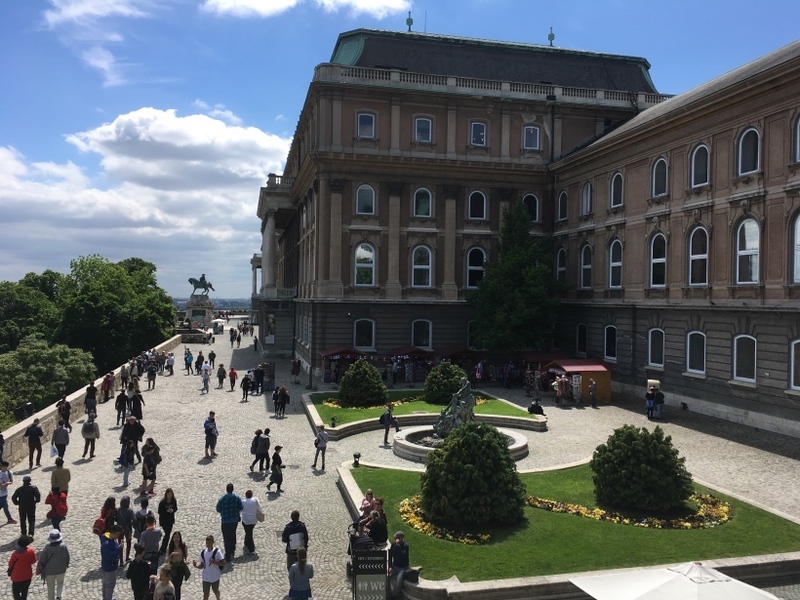 We then rode the trolley to the Buda Castle, which is a museum now. We discovered that they were closed on Mondays, so we looked around the outside. 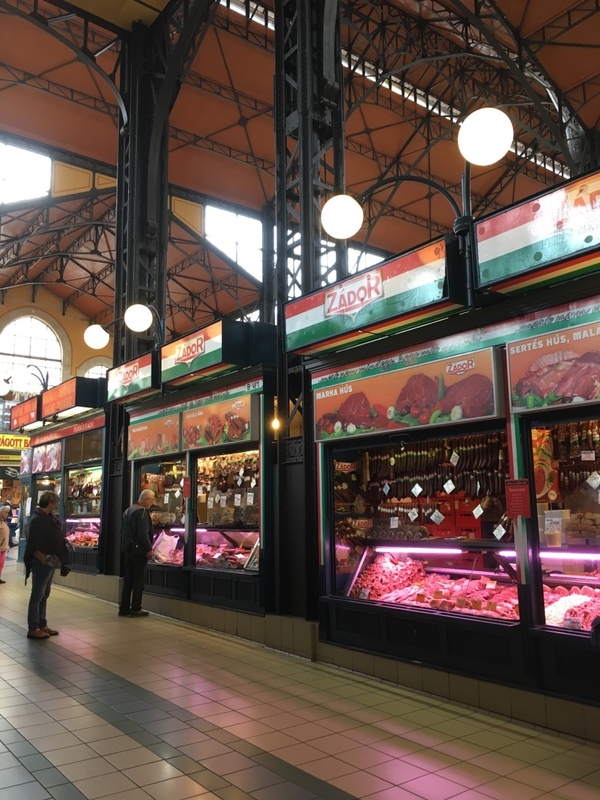 We then walked around and rode the bus around, stopping to eat at a Hungarian Restaurant. 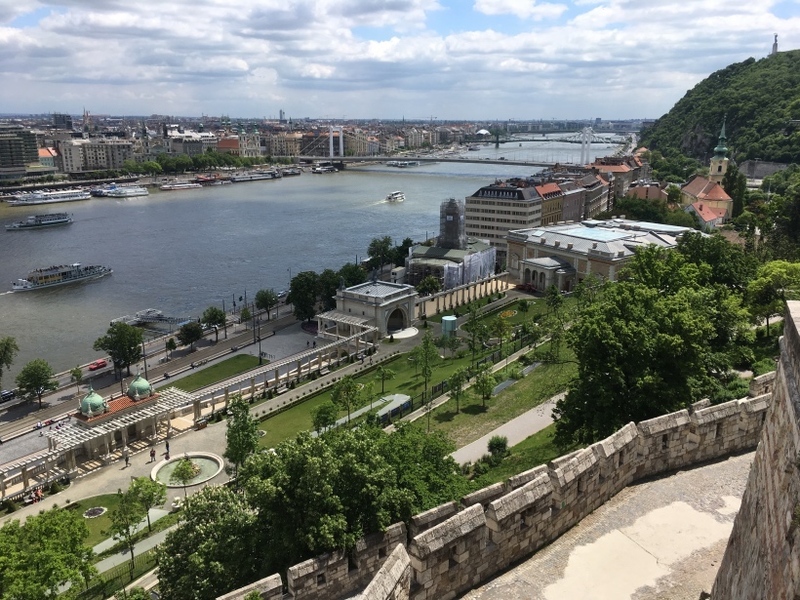 < < View across the Danube from Buda Castle. 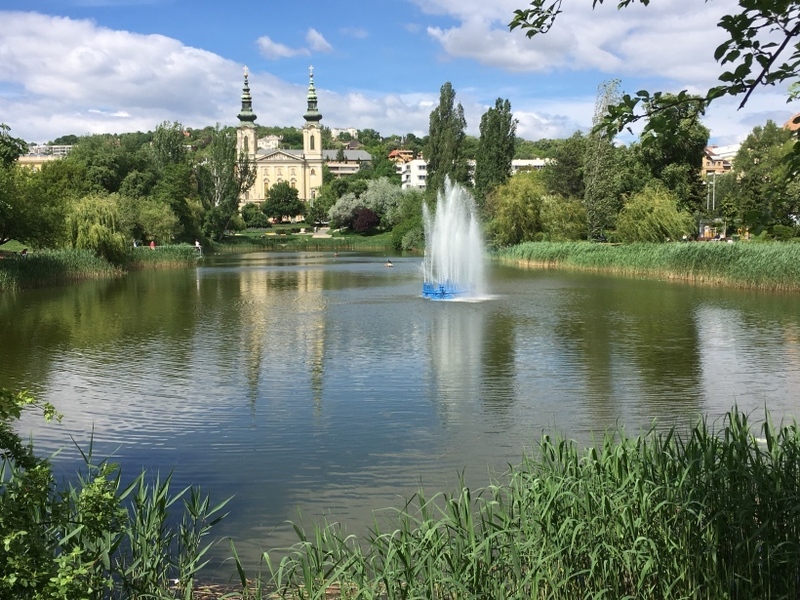 < Nice Park across from Church of Szentimreváros. After our mid-afternoon lunch, we rode the trolley to the Parliament and took our guided tour. 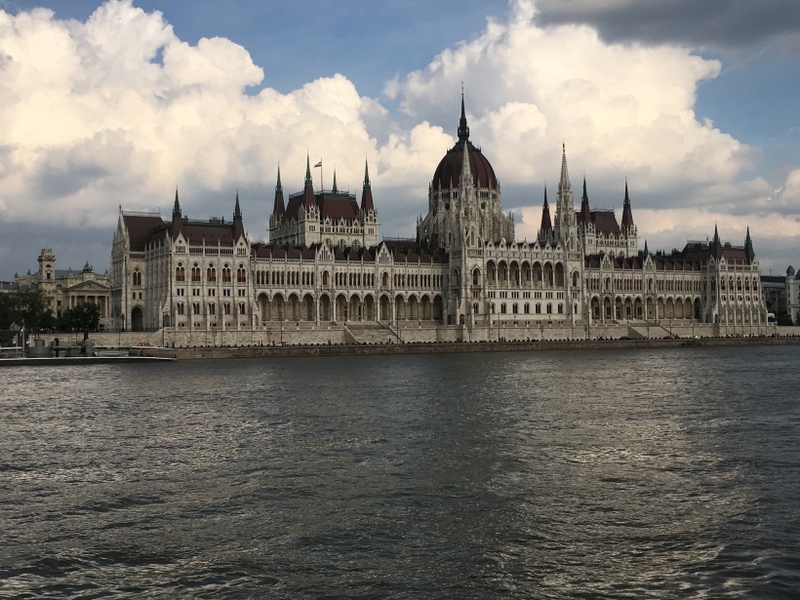 < Hungarian Parlament from across the Danube River. We went back to our hotel and relaxed until it was near sundown. 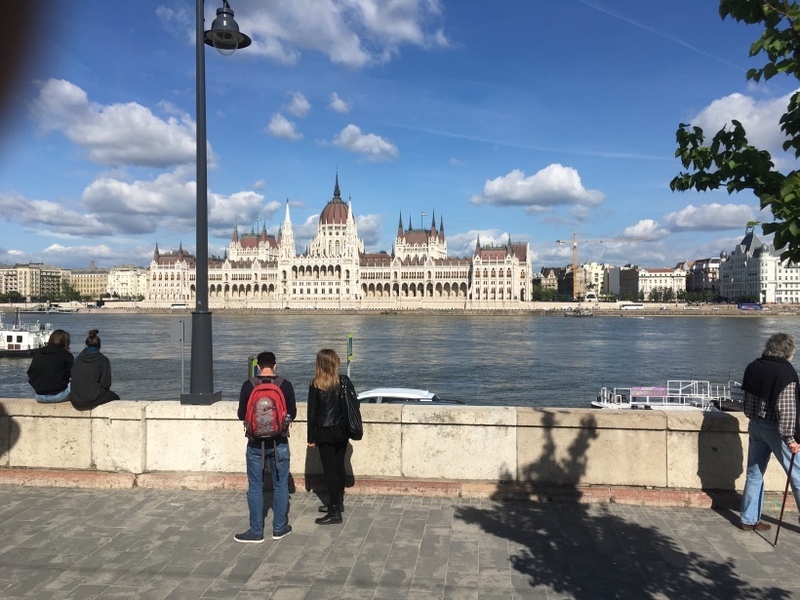 We then rode the trolley to the river and walked along the river from one bridge to the next, passing by the Parliament which was lighted beautifully. We rode the bus #9 to the hotel. 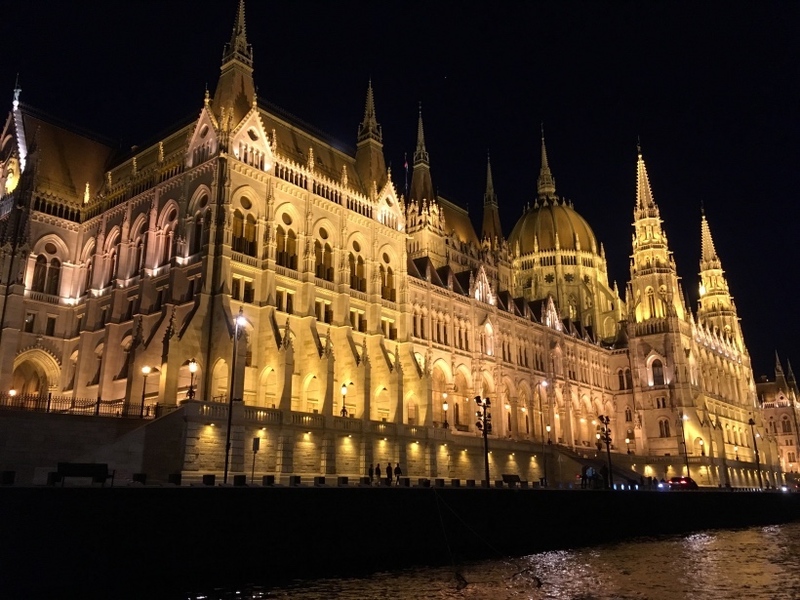 < Hungarian Parlament at night. 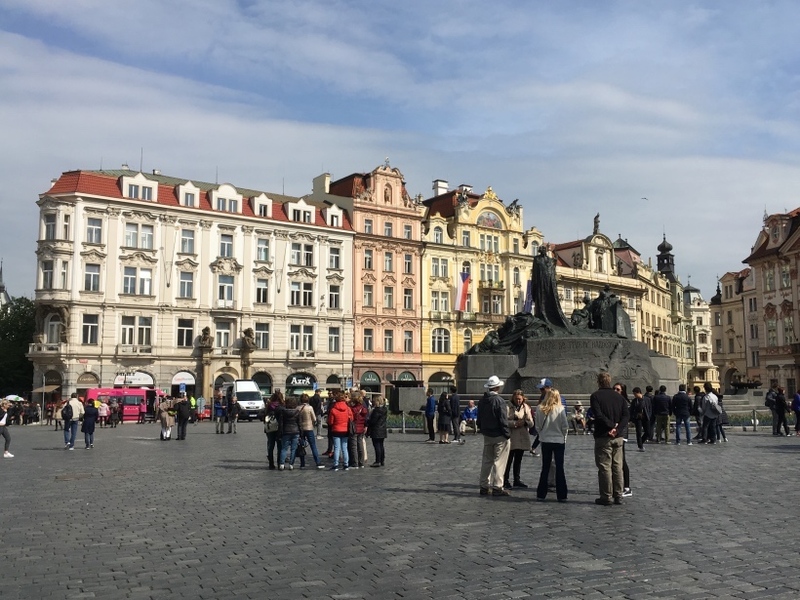 [Tuesday, May 09] We took a taxi from the hotel to the nearby Keleti Train Station and took train EC 278 from Budapest to Prague HL.N. Station. 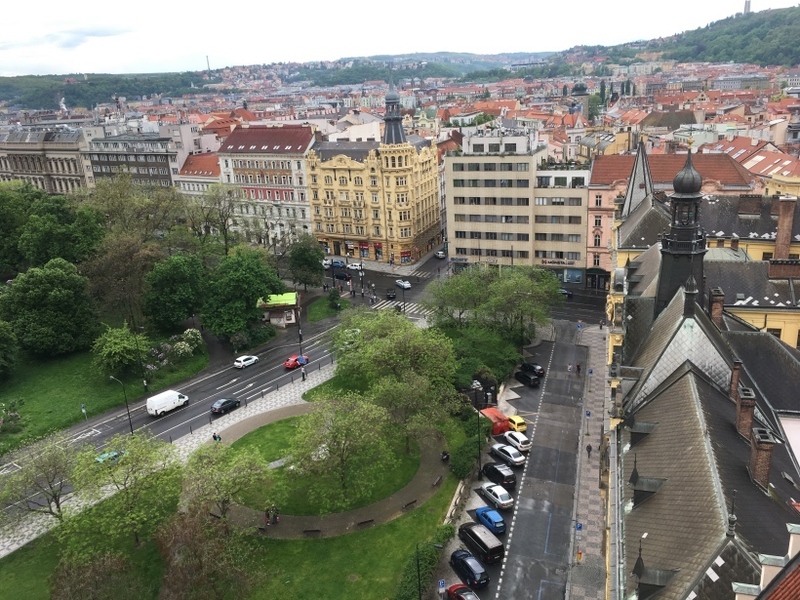 We left Budapest at 09:25 and arrived in Prague at 16:16. 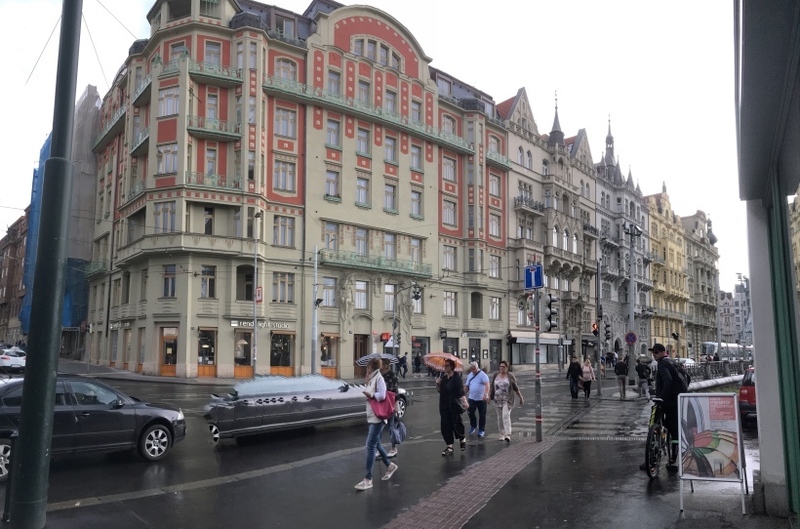 We walked from the train station to The Hotel Liberty. After checking in, we walked down to find where our city tour was to begin tomorrow. 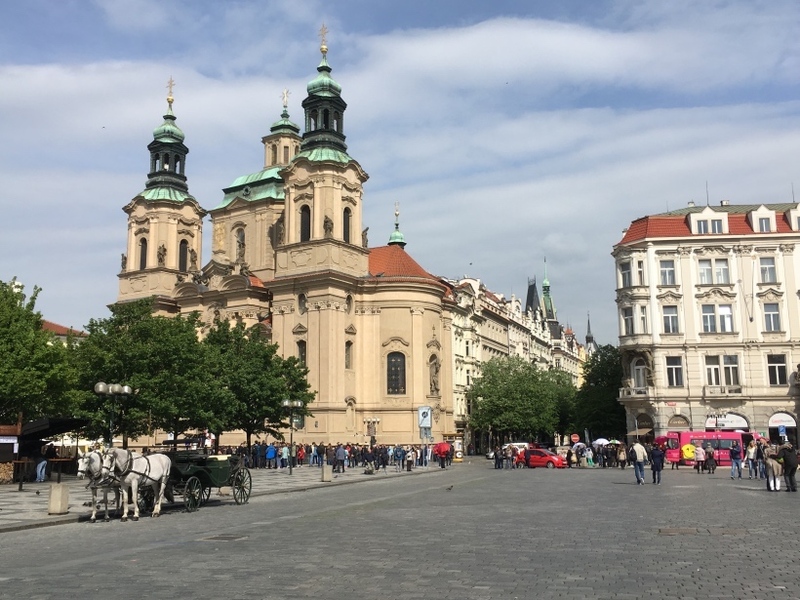 [Wednesday, May 10] Today we took a Small-Group (only 5, including the guide) Prague City Walking Tour, including a Vitava River Cruise and Lunch. 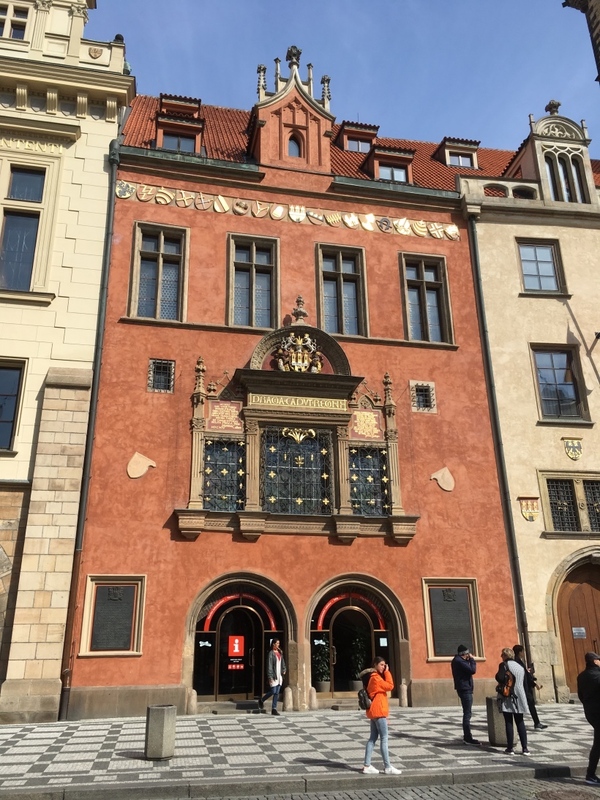 We started out in front of the Municipal House and walked into the Old Town Square, and the Jewish Quarter, followed by a Czech lunch at an Old Town restaurant. 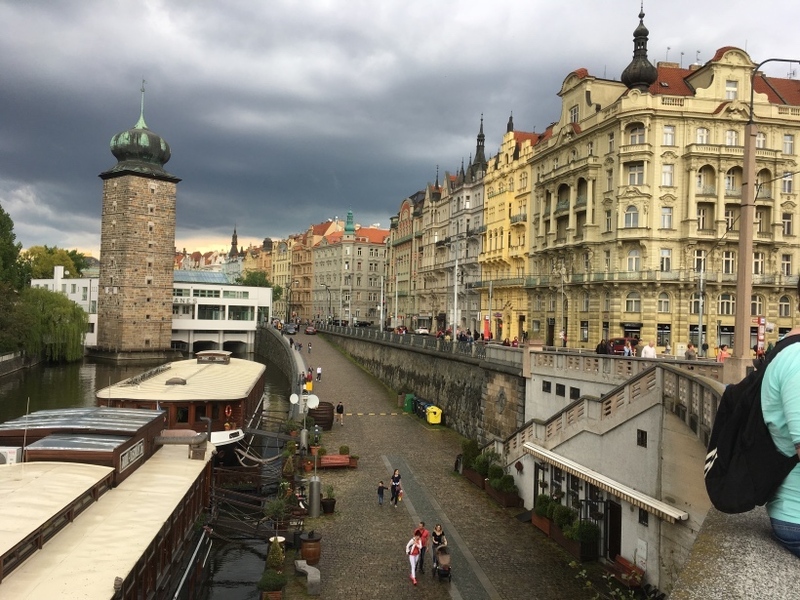 We then took a cruise on the Vitava River and saw sites including the Charles Bridge. 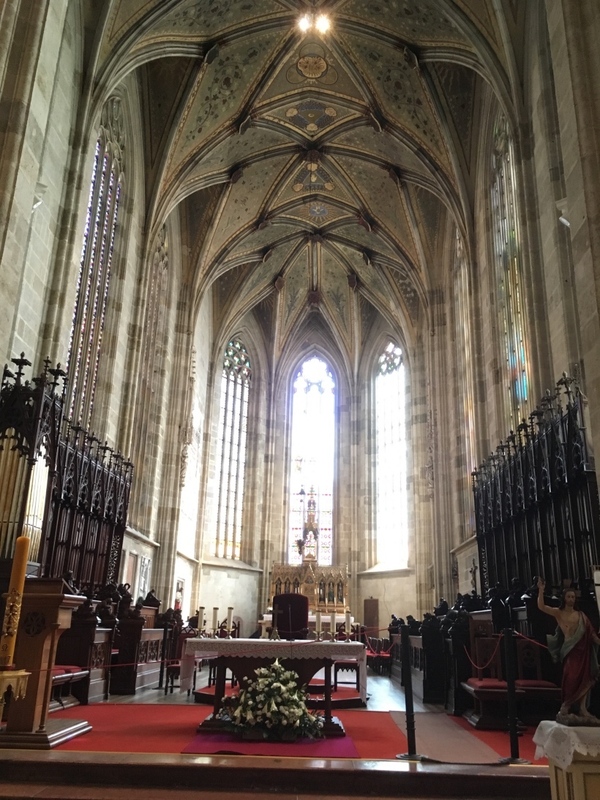 We finished with a tour of St Vitus Cathedral, the Gothic showplace of Prague Castle. < < < < < Around Old Town Square. < On the Charles Bridge. 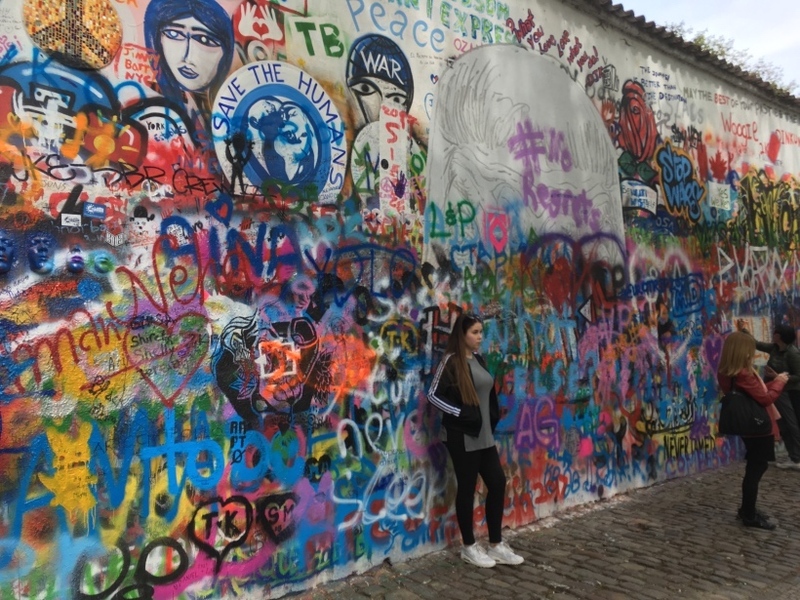 < The John Lennon Wall. 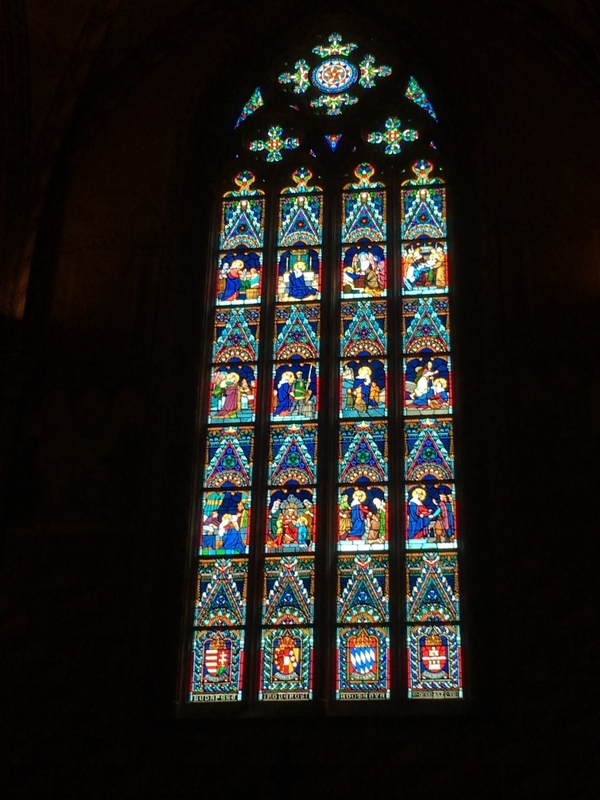 < < < St Vitus Cathedral. 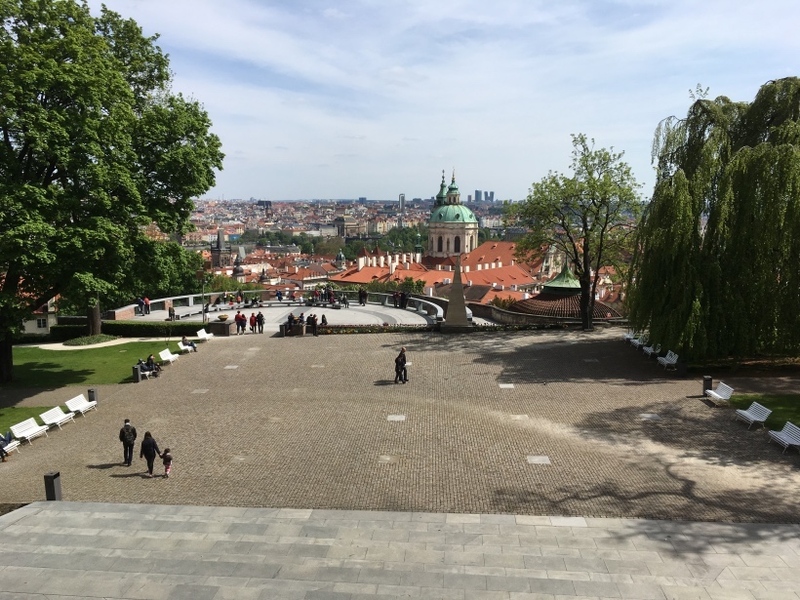 < View from Prague Castle. 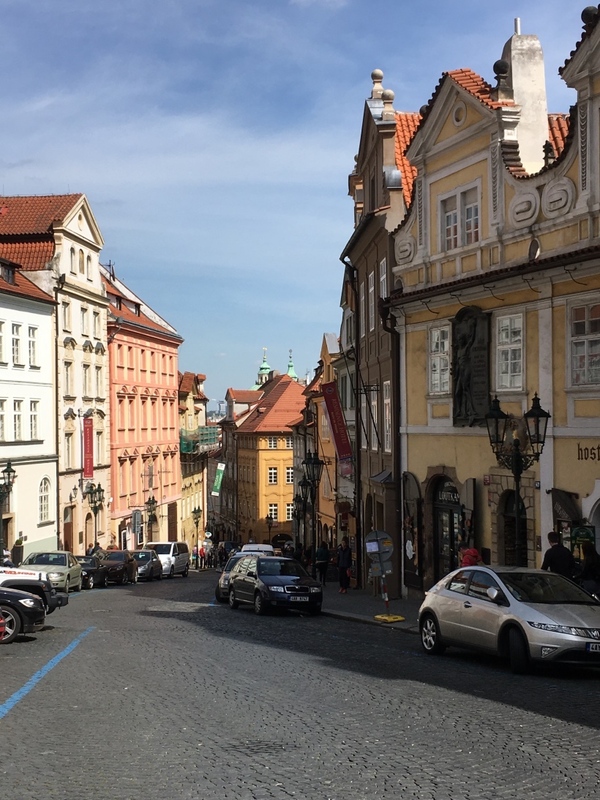 < < Prague street scene. 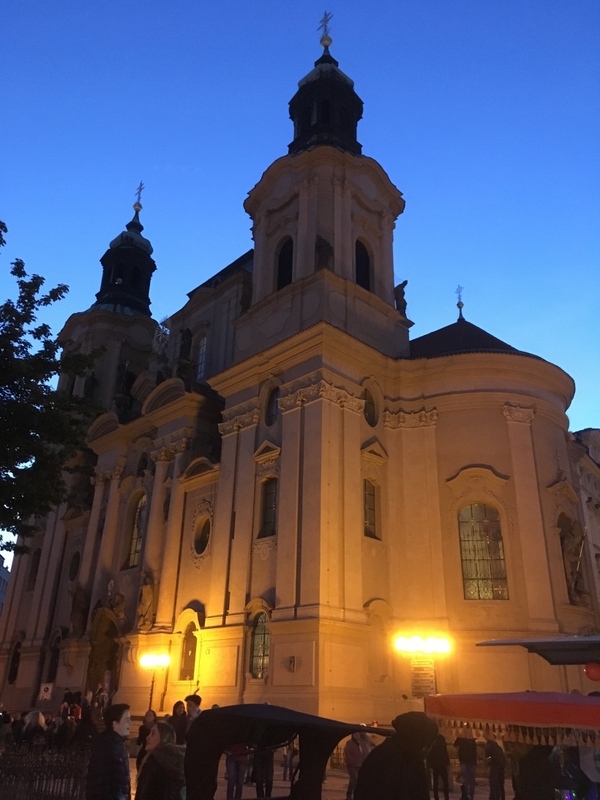 After returning to the hotel for a short period of relaxation, we attended a concert at St. Nicholas Church - a 20:00 performance by the Consortium Pragense Orchestra, playing selections from Vivaldi, Schubert, Dvorak, and Gershwin. < < St Nicholas Church. 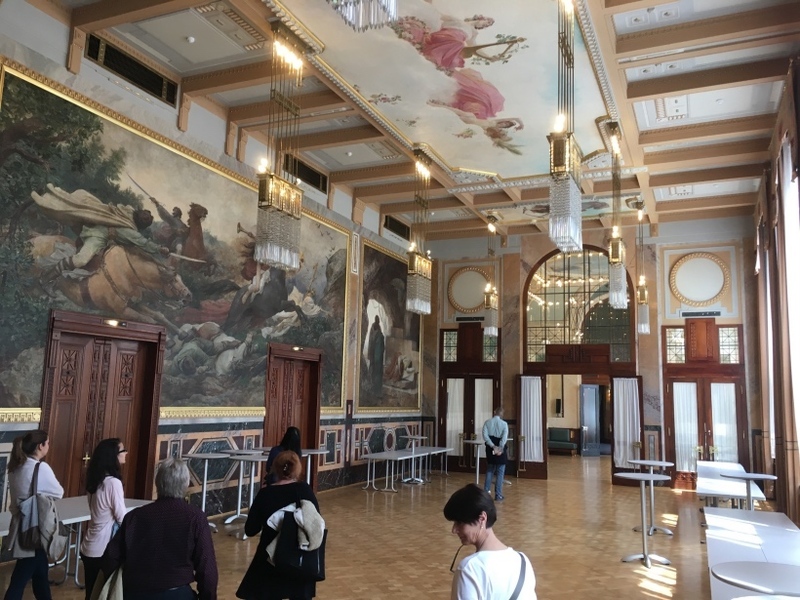 [Thursday, May 11] Today we went to the Municipal House to arrange a tour but discovered that tours were not being given today. 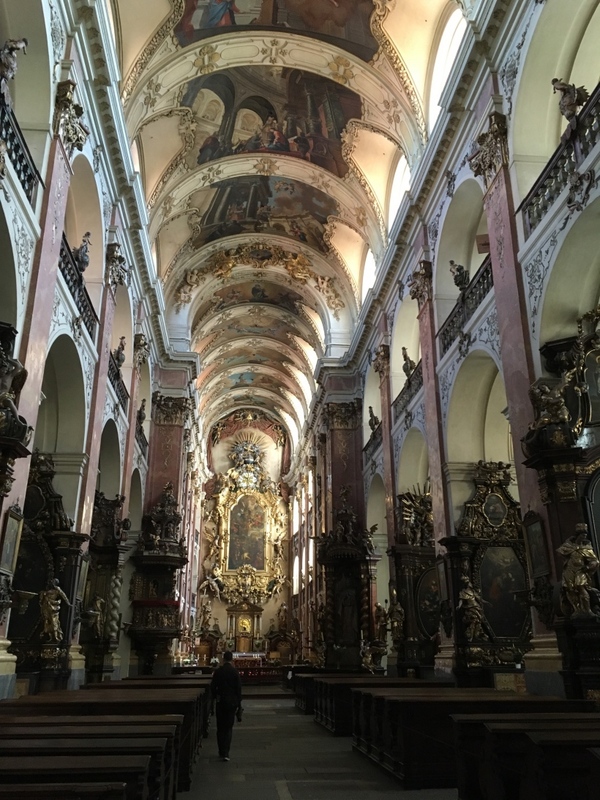 We then walked to Old Town Square and stopped at St. James Basilica and looked around inside. 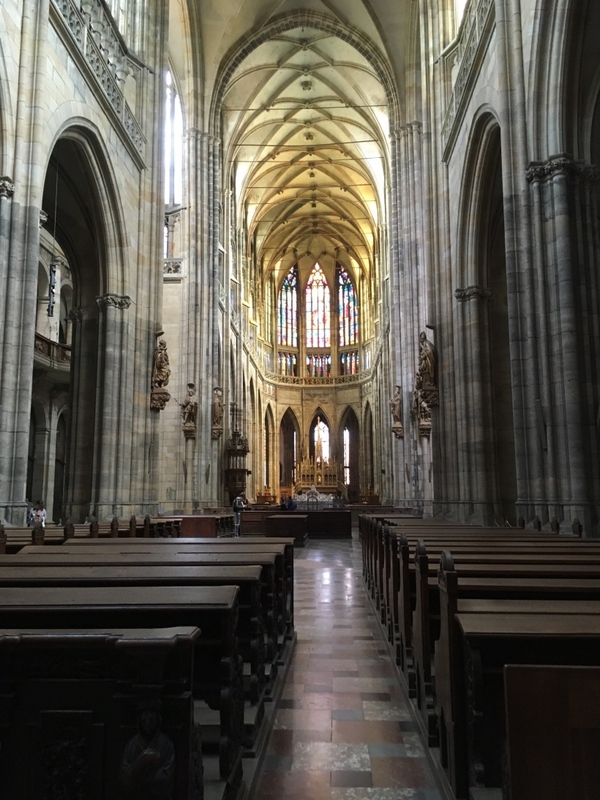 The church contains the largest organ in the Czech Republic. < < St James Basilica. 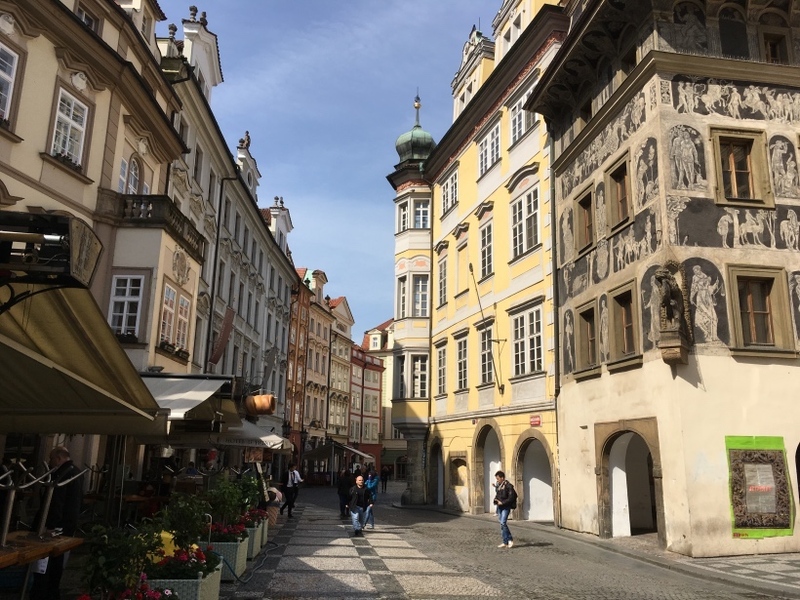 Then we walked along Celetna Street, one of the oldest streets in Prague. Most of the houses along the street date from the Middle Ages. 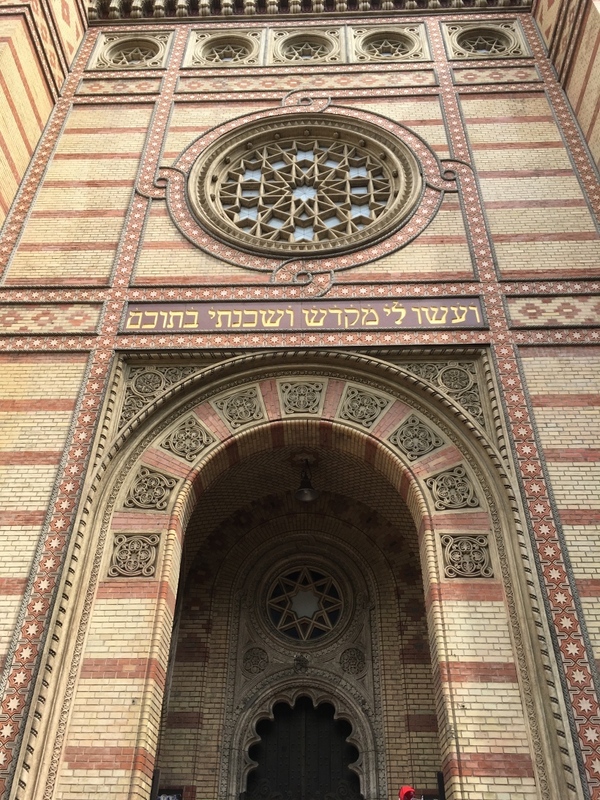 We ate lunch at a restaurant across from The Spanish Synagogue. 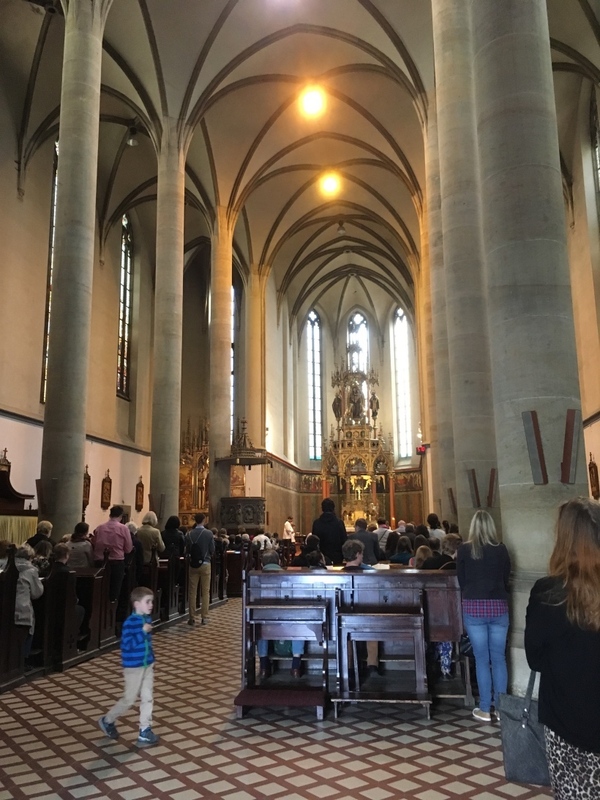 We then went inside The Church of the Holy Spirit that was across the street from the synagogue. 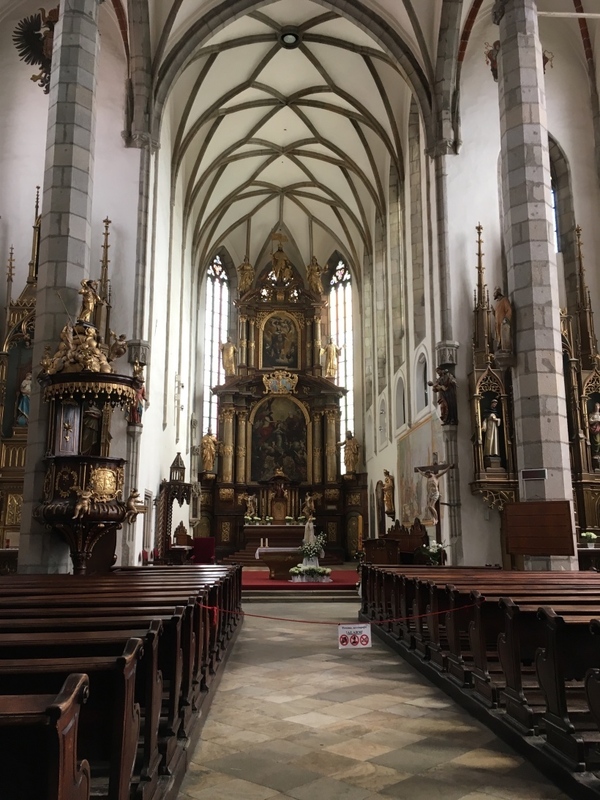 The church was built in the first half of the 14th century for a Benedictine convent that originally stood at the western part of the church. < < Church of the Holy Spirit. 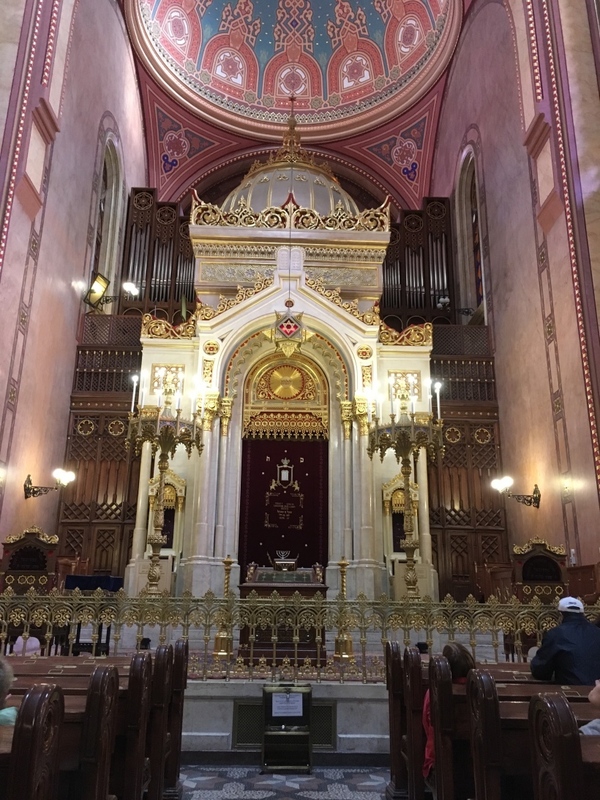 Afterwards we toured the Spanish Synagogue, which is now a beautiful museum. It was built in the late 1800's with a Moorish design. 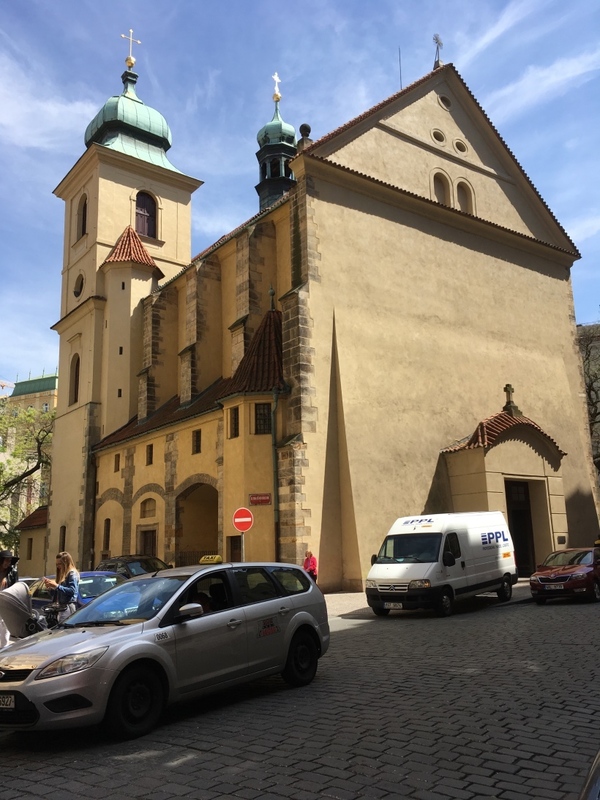 Prague's first synagogue once stood on this site. 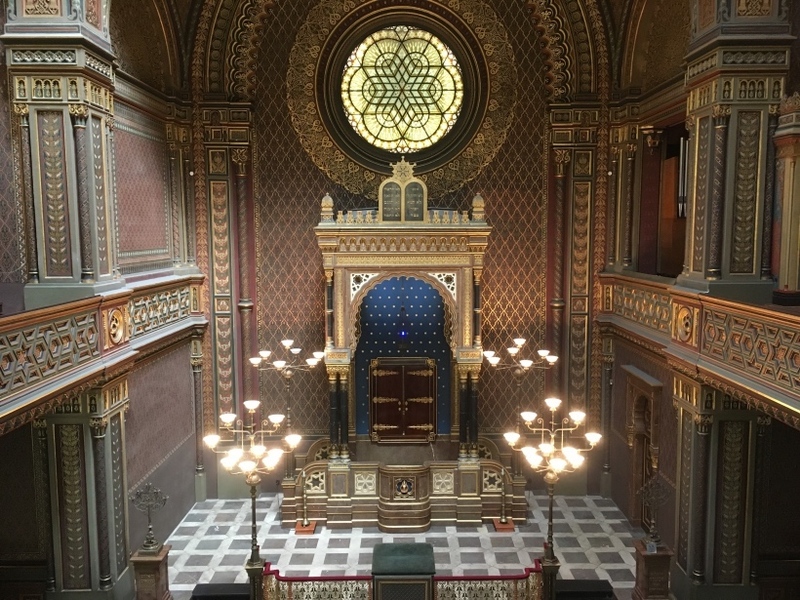 < < < Spanish Synagogue. 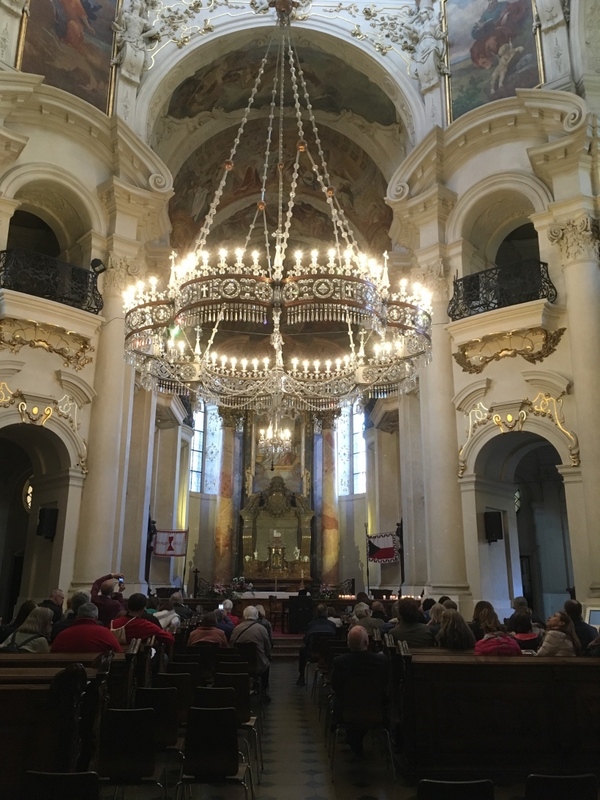 After returning to our hotel for a short break, we walked to St. Nicholas Church to a concert by The St. Nicholas Chamber Soloist. They performed selections by Vivaldi, Handel, Bach and C. Saint-Saens. 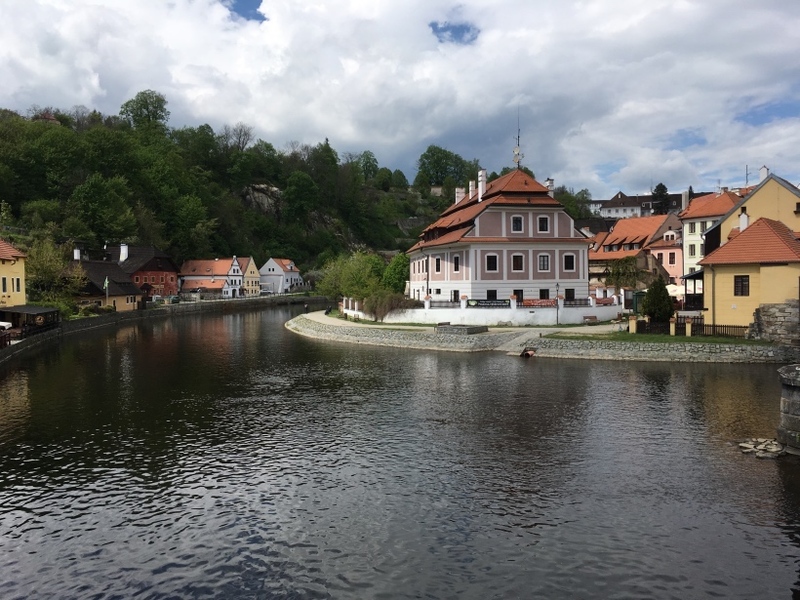 [Friday, May 12] We scheduled an all day tour of the Medieval town of Cesky Krumlov, which was about a two and a half hour drive south of Prague. The town, one of the most visited in the Republic, was founded in the 13th century. We left in a minivan at 09:00 and it took until 12:00 to arrive at our destination, after a pit stop. We took a short walk through the city, then ate lunch at a restaurant. 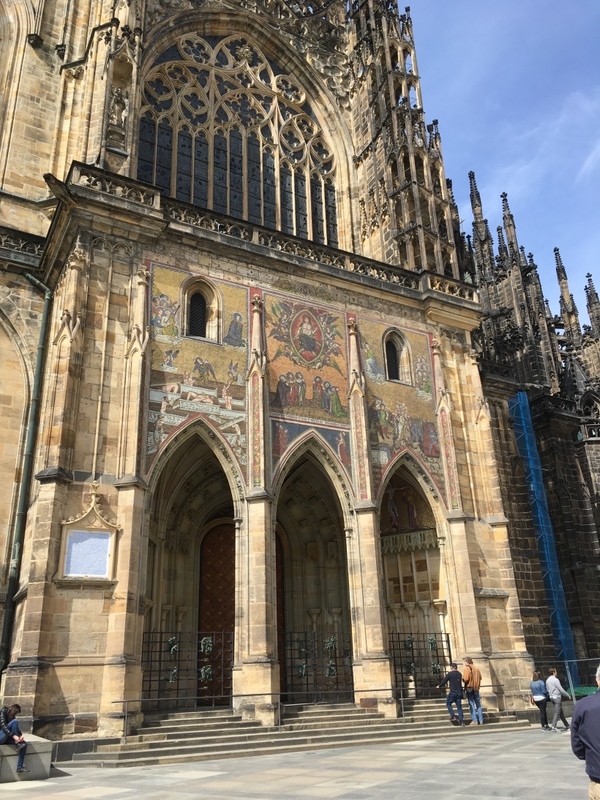 After lunch, we walked around on our own and and went inside St. Vitas Cathedral. 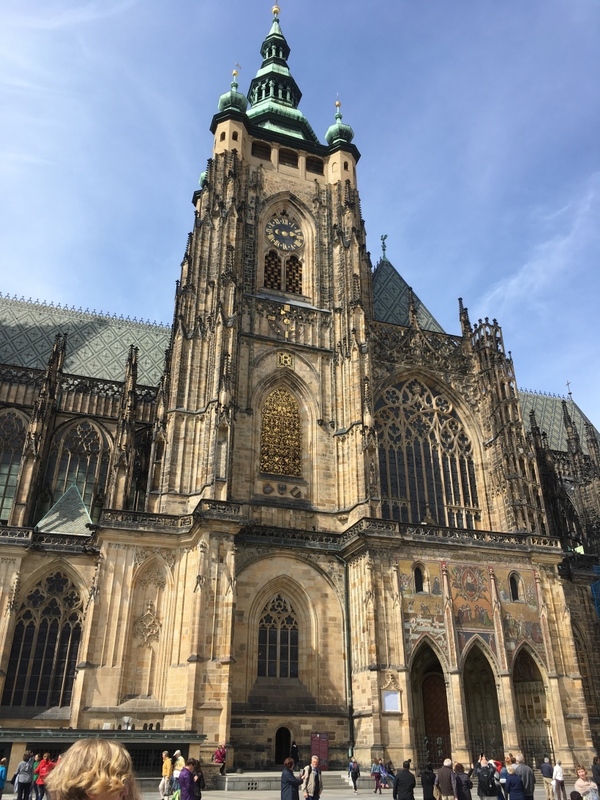 < < St Vitas Cathedral. 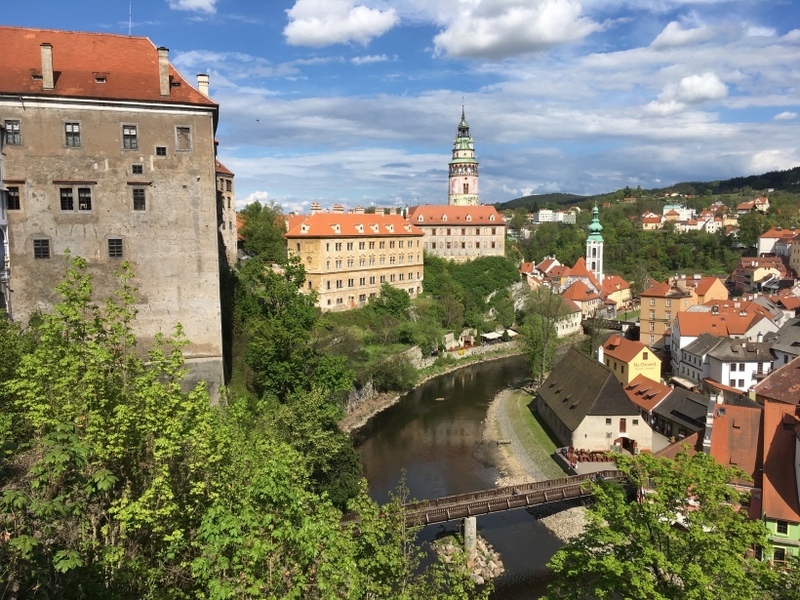 At 15:00, we took a one hour tour of Krumlov Castle, the main attraction in the village. 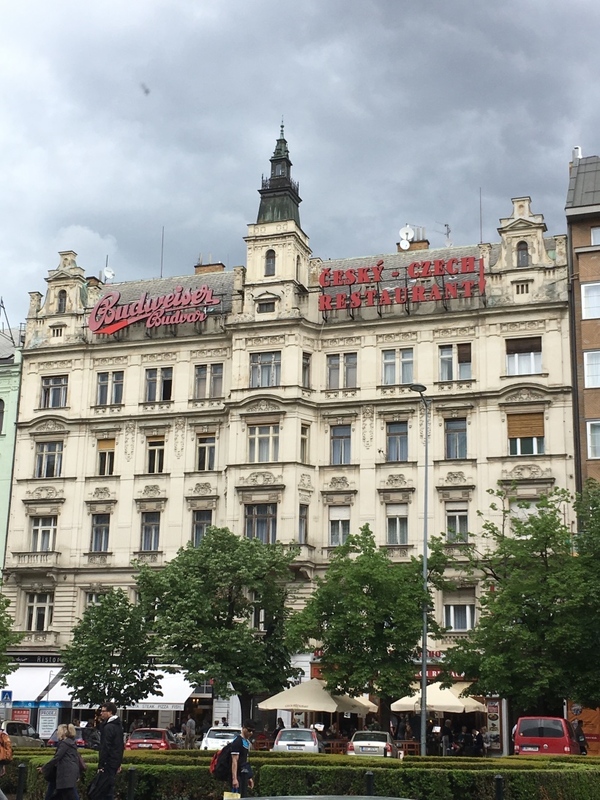 We returned to Prague and arrived back at our hotel about 20:00. 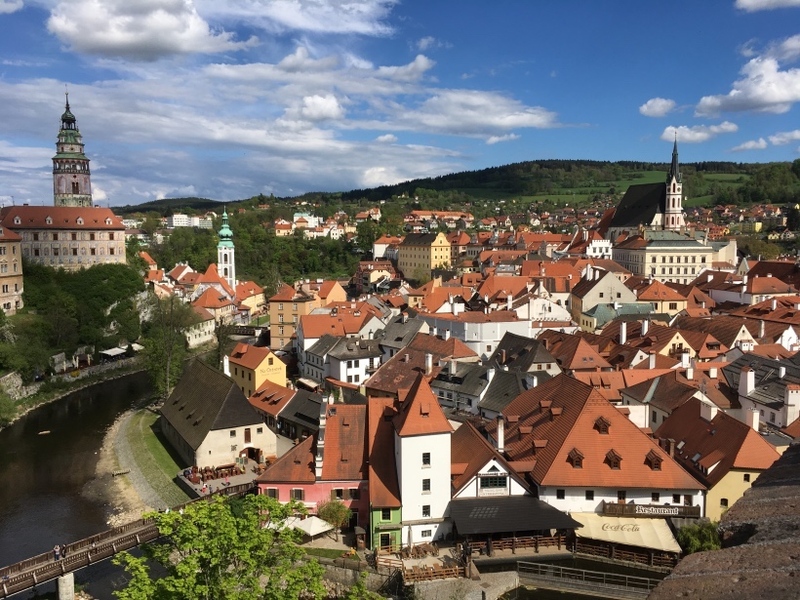 < < < < Cesky Krumlov. 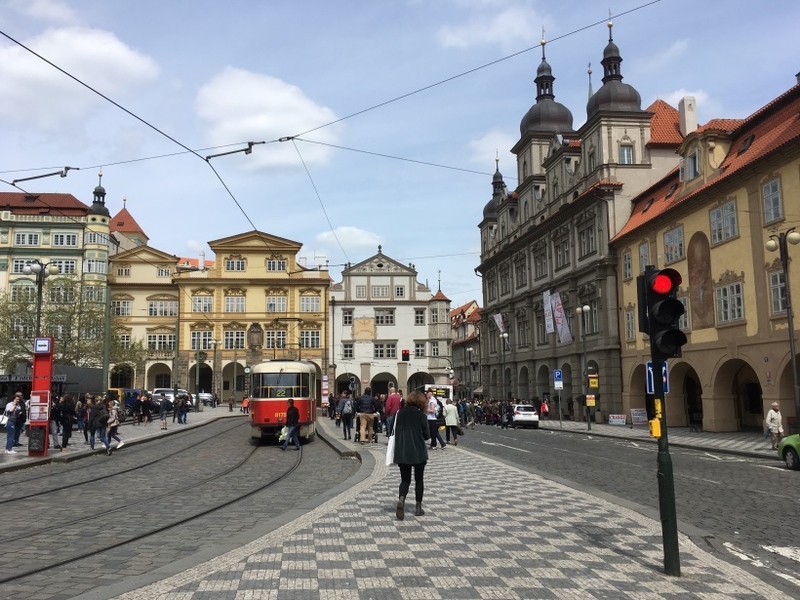 [Saturday, May 13] We walked to the Prague Main Railway Station and purchased our tickets for the train to Bratislava on Monday. We then walked to the Municipal House and purchased tickets for the 20:00 concert on Sunday. We also purchased guided tour tickets for 12:00 today. We walked around the area taking up time until our tour. We stopped for coffee and a snack. at an interesting coffee shop. We rode the trolley back to the Municipal House and took the tour. 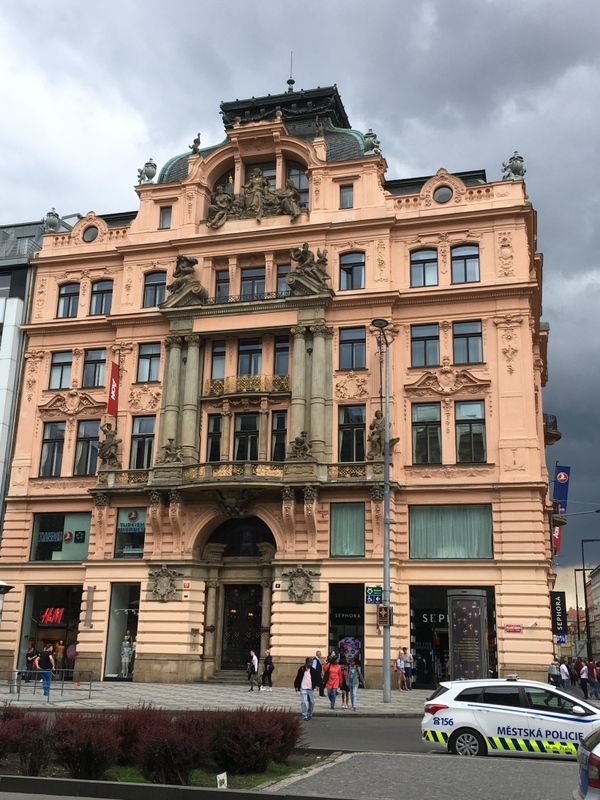 The Municipal House is Prague's most prominent Art Nouveau building and was built in 1905-11 on the site of a former royal palace. 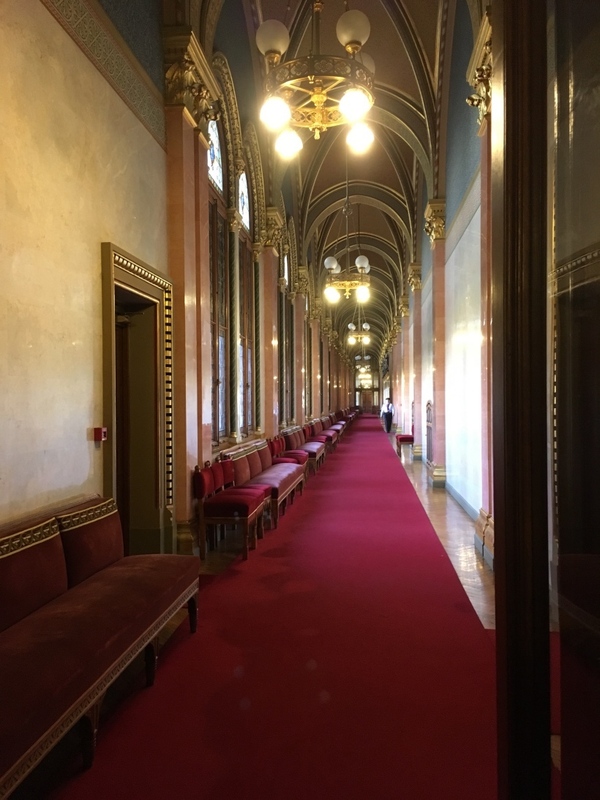 The flamboyant interior is decorated with works by leading Czech artists. 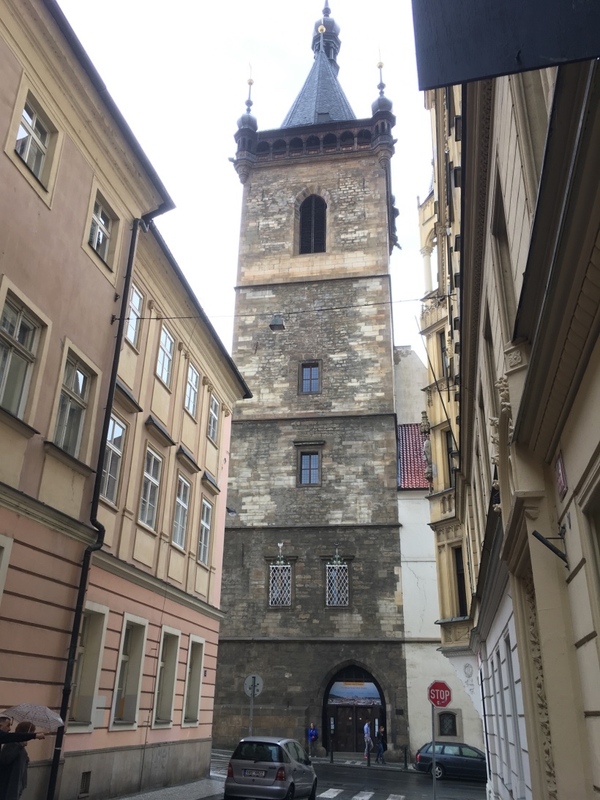 < Old Powder Gate is a relic of when there was a royal palace. < < < < Municipal House. 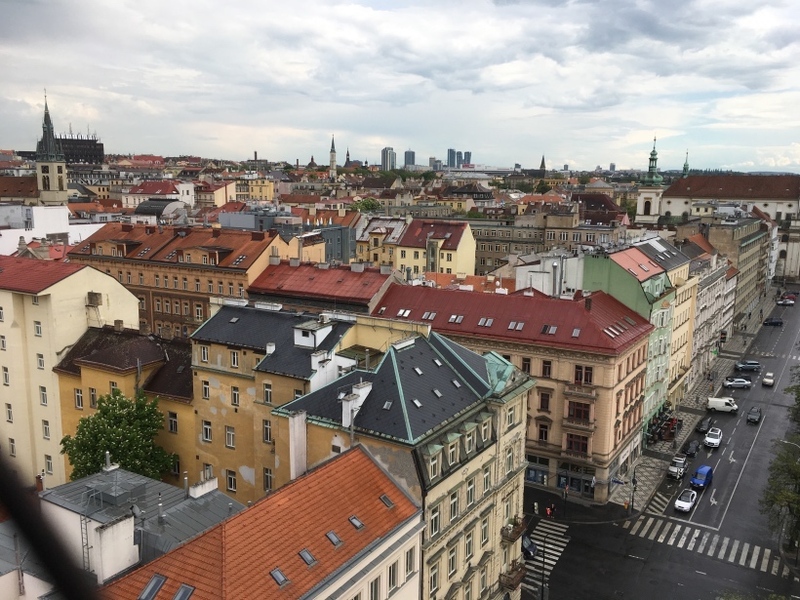 We walked along the Vitava River through the New Town section (dodging rain showers) and walked up 221 stairs to the top of The New Town Hall Tower for a great view of the city. 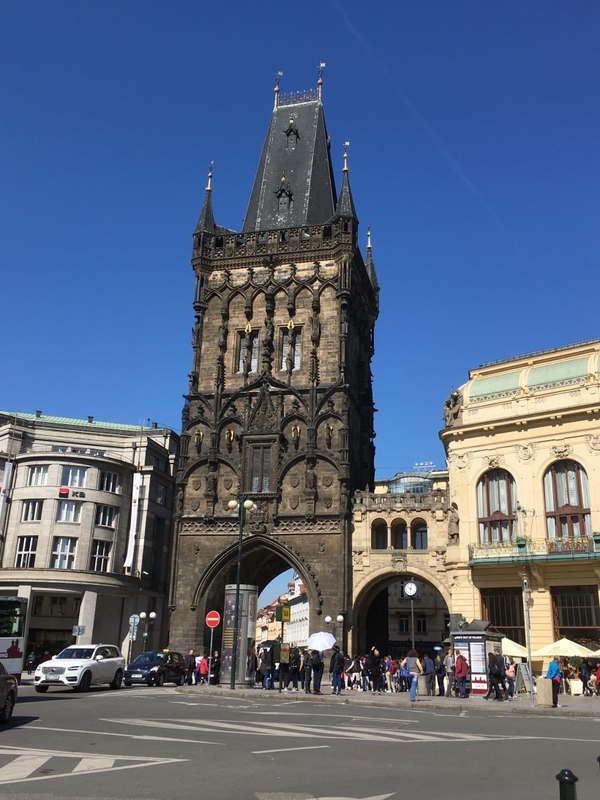 The tower was built in 1452-6. 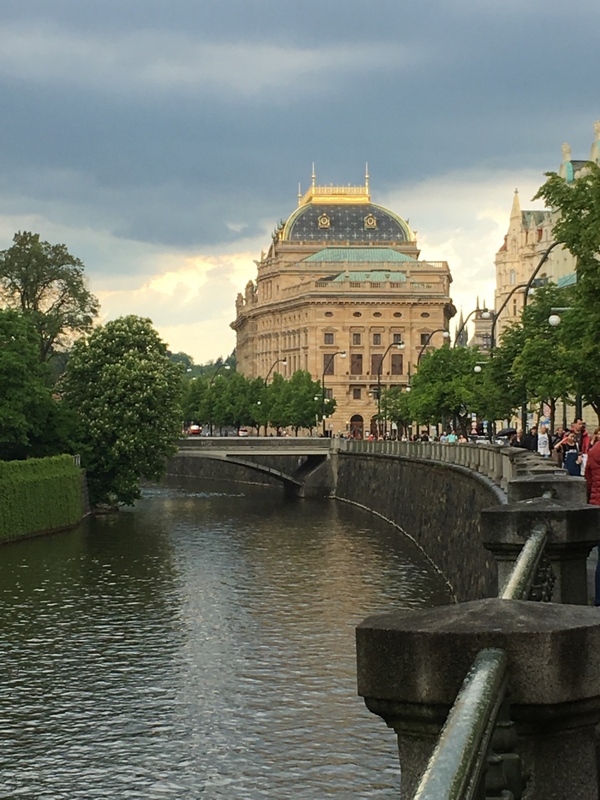 < Vitava River looking toward the National Theatre. < < New Town street scene. 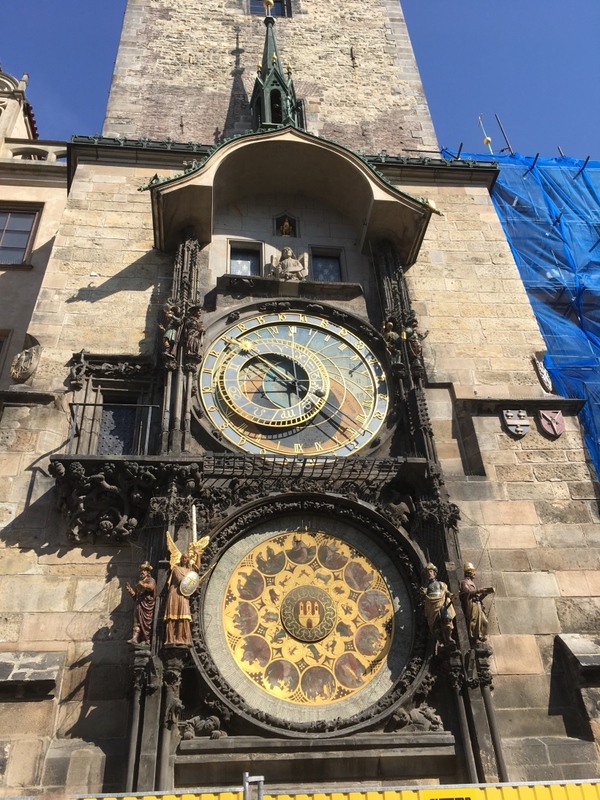 < New Town Hall Tower. 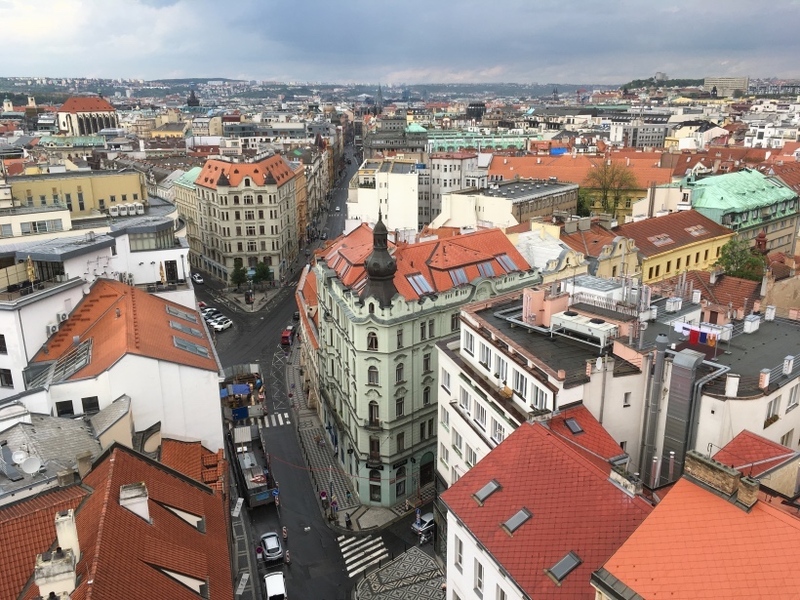 < < < View of Prague from New Town Hall Tower. 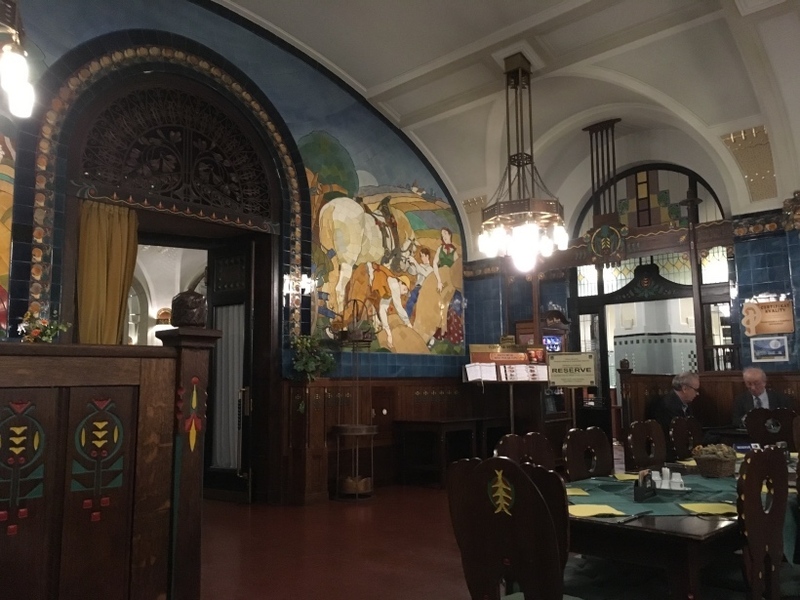 We went back to the Municipal House and ate dinner at the Plzenska Restaurant in the basement. 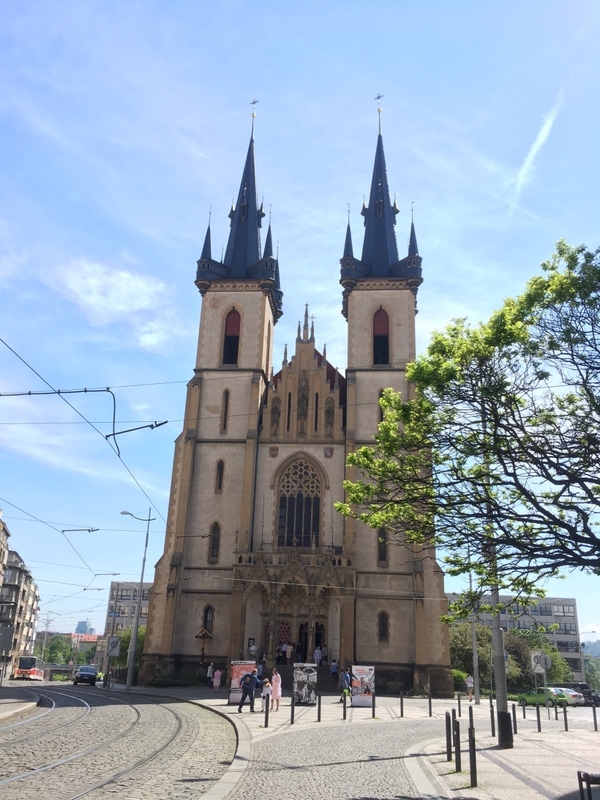 [Sunday, May 14] We rode the subway to the Hradcany section, across the river from our hotel. 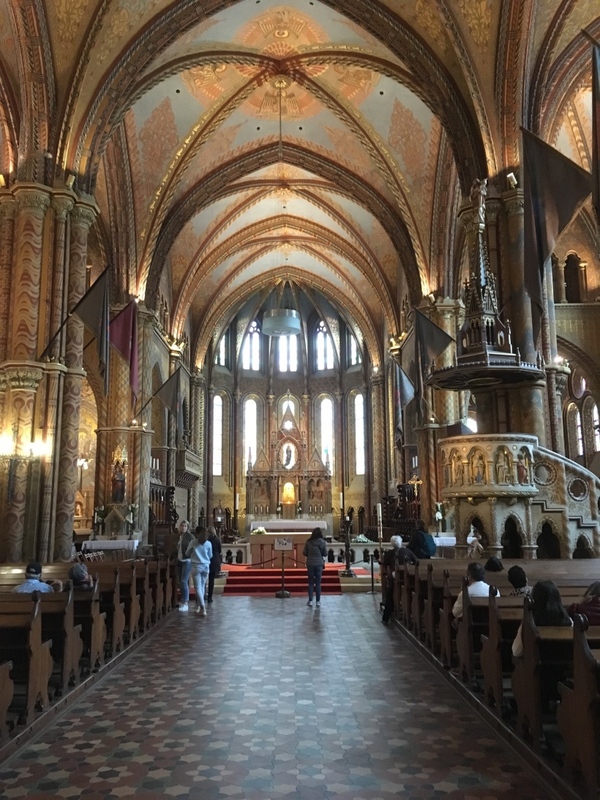 We walked around and went inside the Church of St. Anthony of Padua after their Sunday morning service. Their beautiful organ was playing at the end of their service and sounded magnificent. 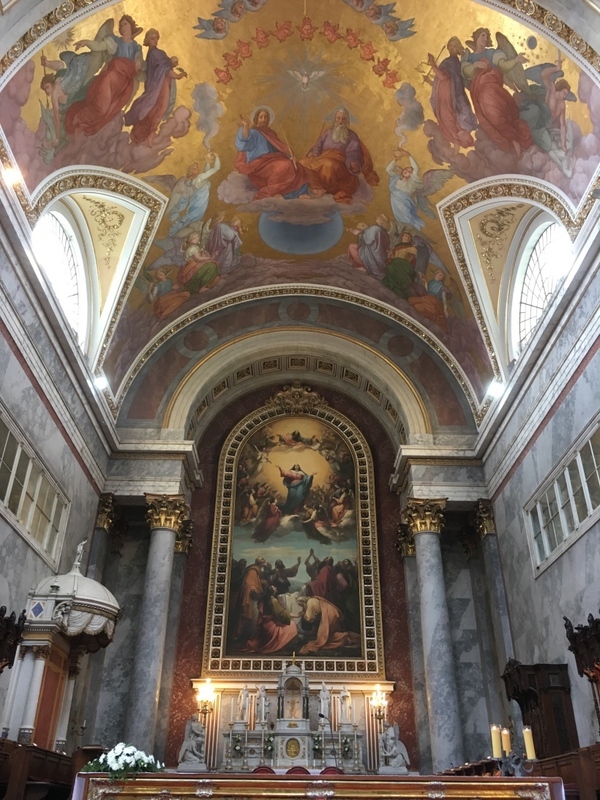 < < Church of St. Anthony of Padua. Afterwards, we rode trolley into the suburbs, then the subway back to near our hotel. 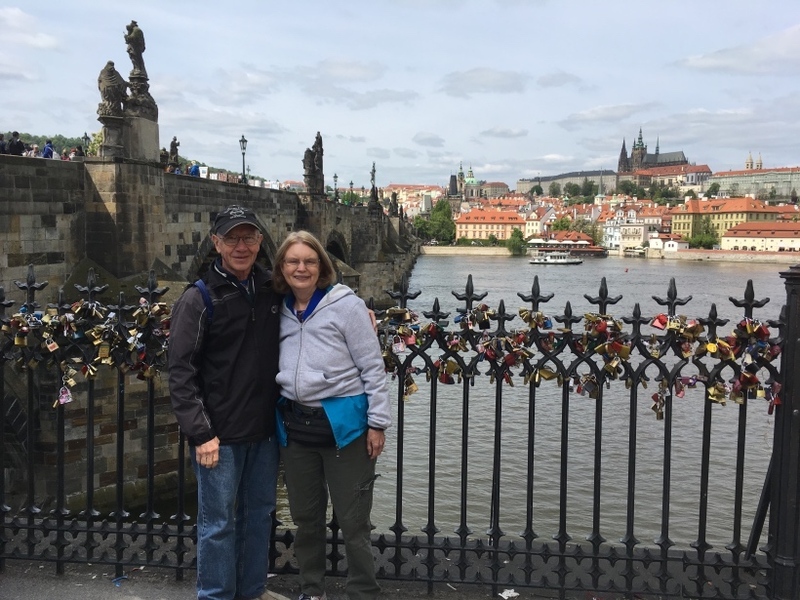 After a short break, we rode the subway across the river to the Prague Castle. 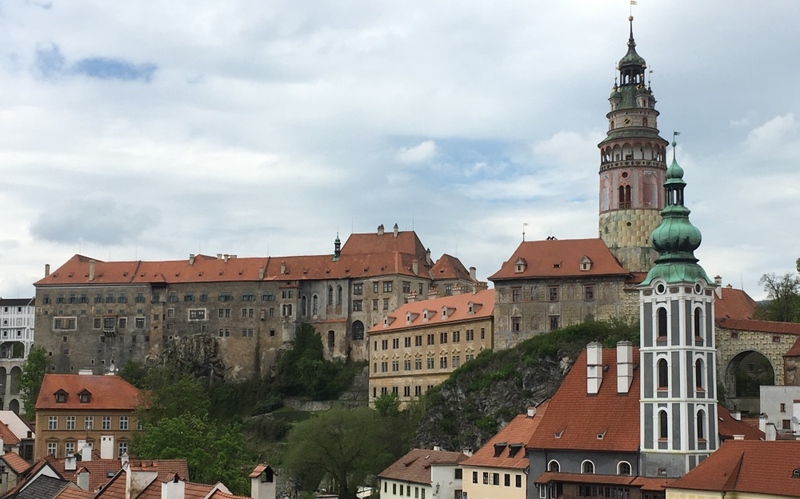 We walked up to the castle and through the courtyard, then back down to the subway, back to the hotel. 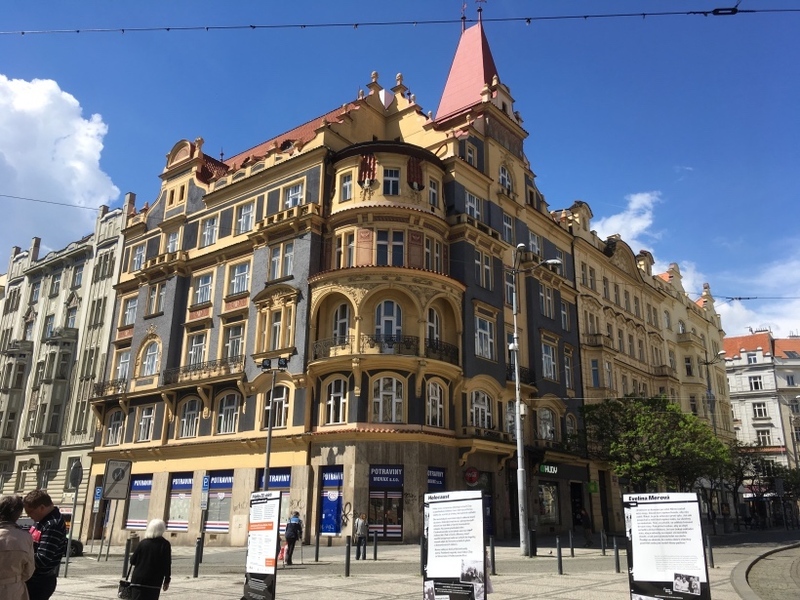 < < < < Beautiful old building in Prague. At 20:00 we attended a concert at the Municipal House to hear the Chamber Orchestra, a portion of the Bohemian Symphony Orchestra. 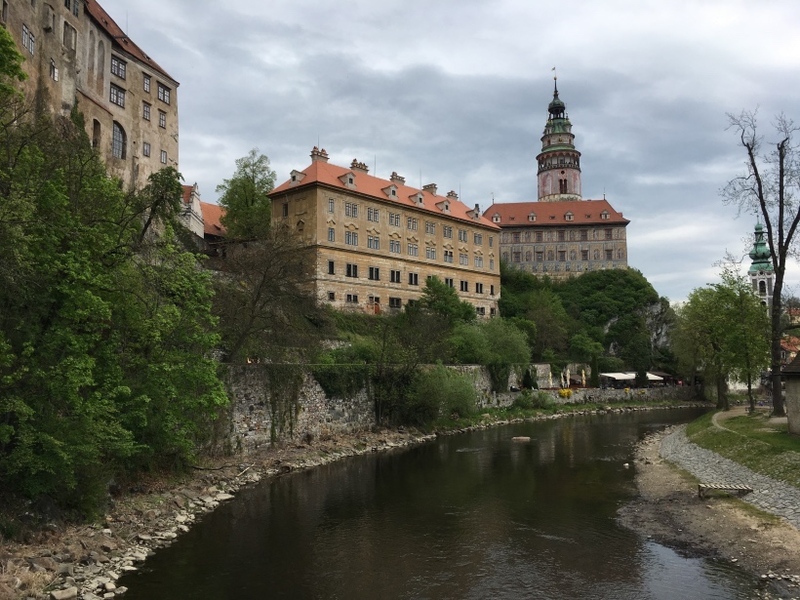 [Monday, May 15] Today we took a taxi to the train station and left Prague for Bratislava, the capital of Slovakia. 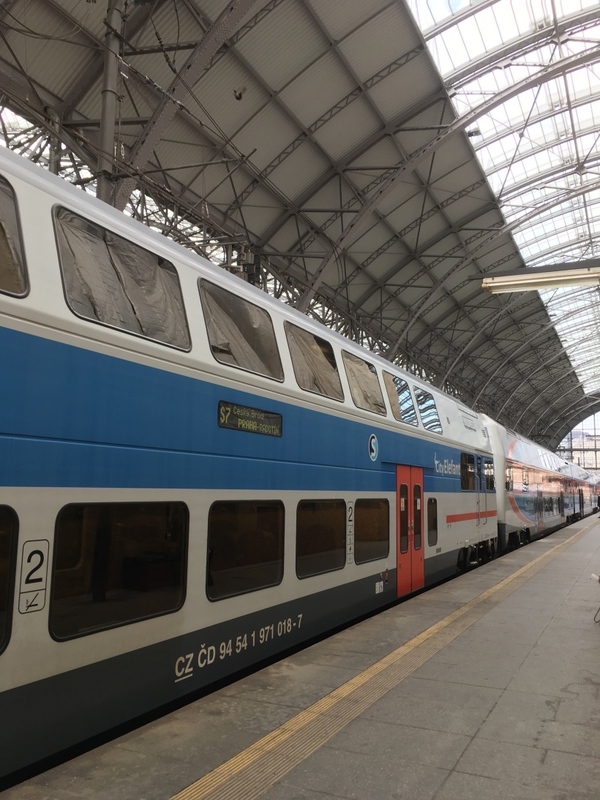 Our train, EC 277, left at 09:52 and we arrived in Bratislava at 13:53. 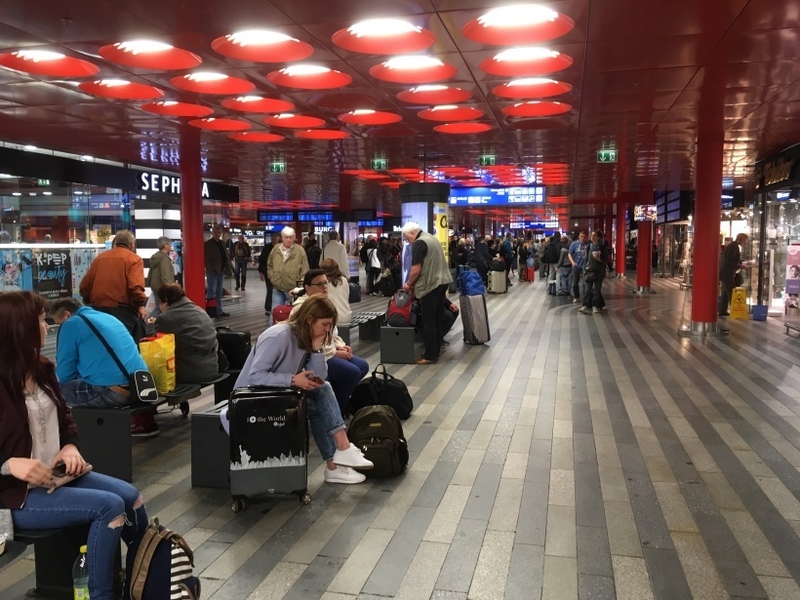 The Prague Railway Station is enormous and very crowded - I would compare it to an airport terminal in the U.S. The train station in Bratislava was more modest, but was also quite crowded for its size. 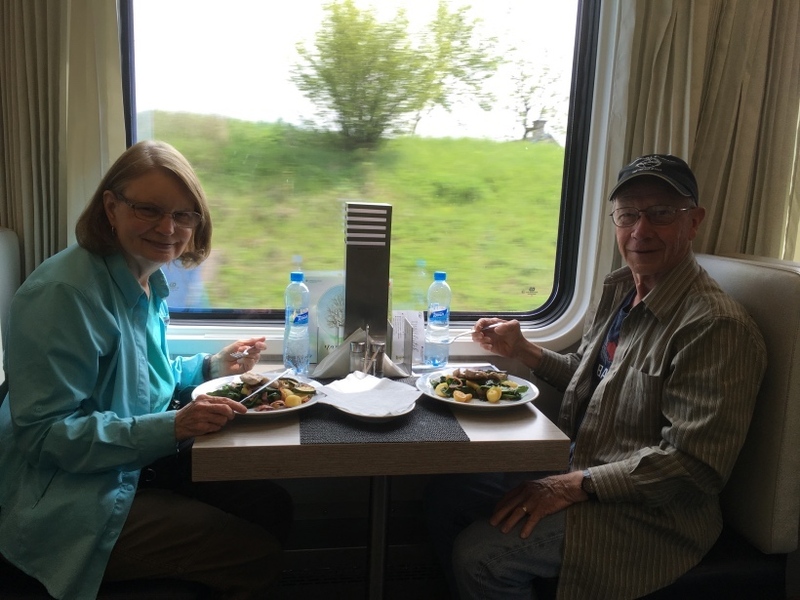 While on the train, we enjoyed lunch in the dining car. It was a good lunch. < Our train. < Kay on the train. < Lunch on the train. 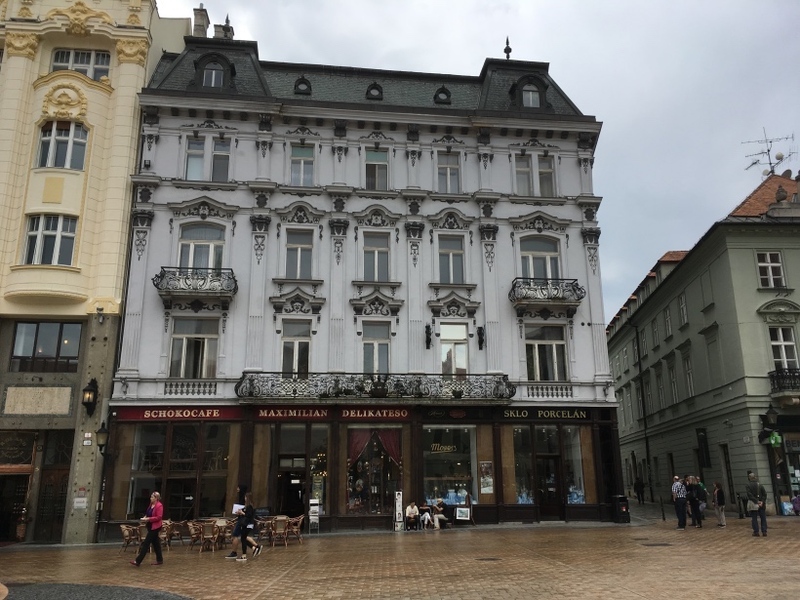 Upon our arrival in Bratislava, we walked to the nearby Wilson Palace Hotel and checked in. 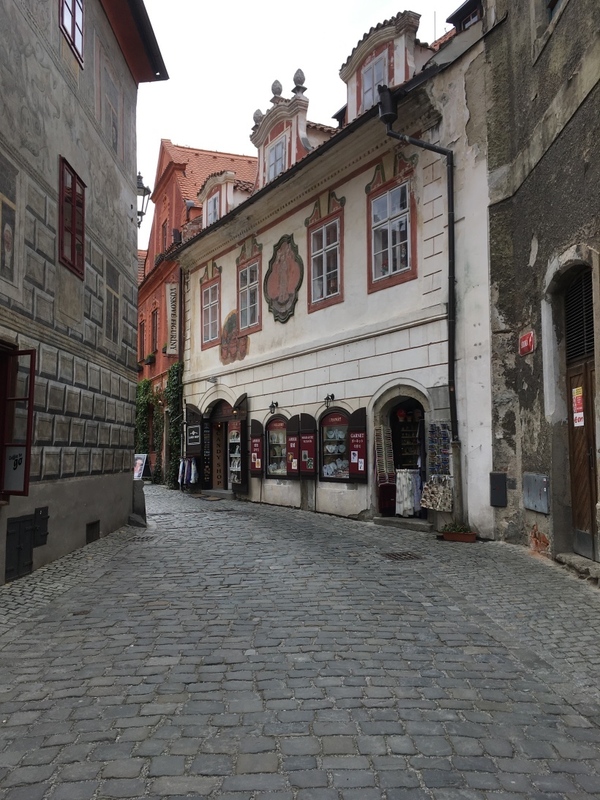 We then walked down the street to the Old Town area around Michael's Gate. We ate dinner in a restaurant near the old gate and walked back to the hotel. < < < Old Town area. 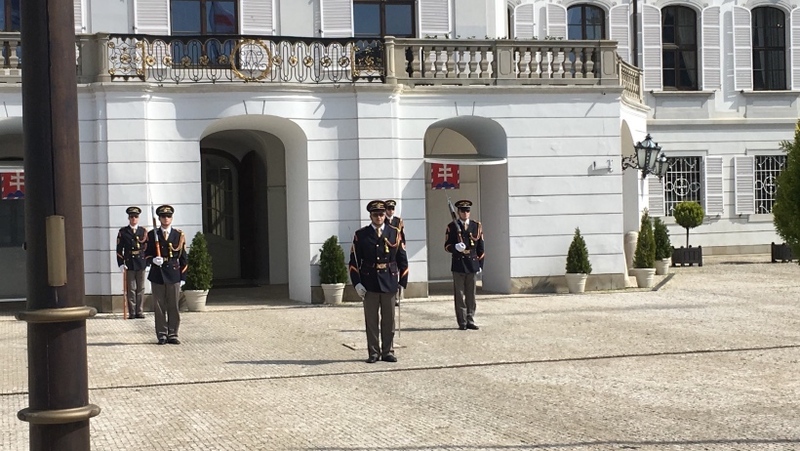 [Tuesday, May 16] Today we walked past the Presidential Palace, which was a block down the street from our hotel, and watched the changing of the guard. < Presidential Palace. < Changing of the guard. 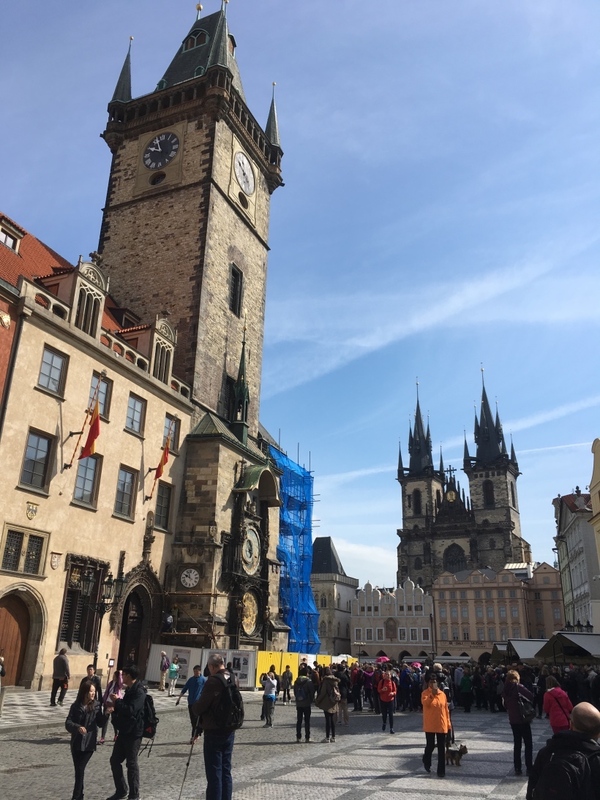 We returned back to our hotel for a 12:00 guided walking tour of the city. 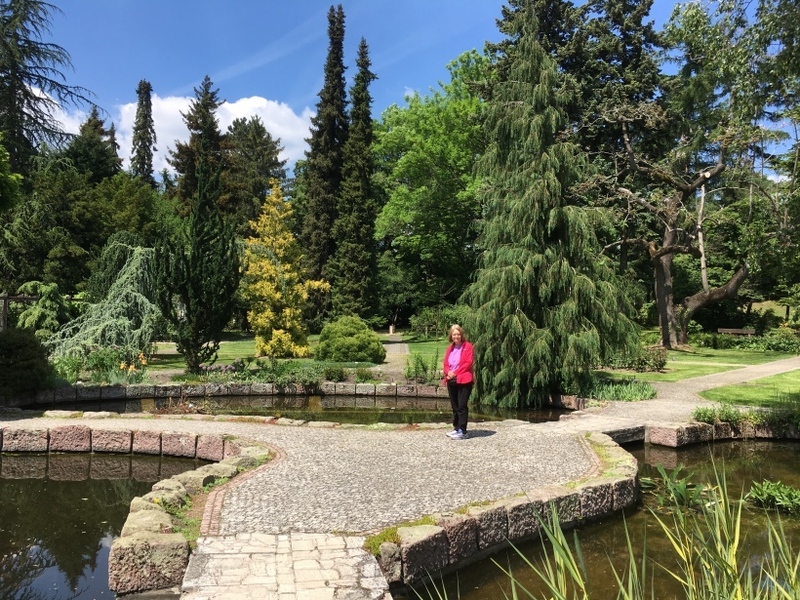 Our guide met us and we walked down to the park behind the Presidential Palace and she gave us a history lesson on Slovakia. Then we walked through the Old Town with her pointing out all the historic buildings and parks. < Michael's Gate. 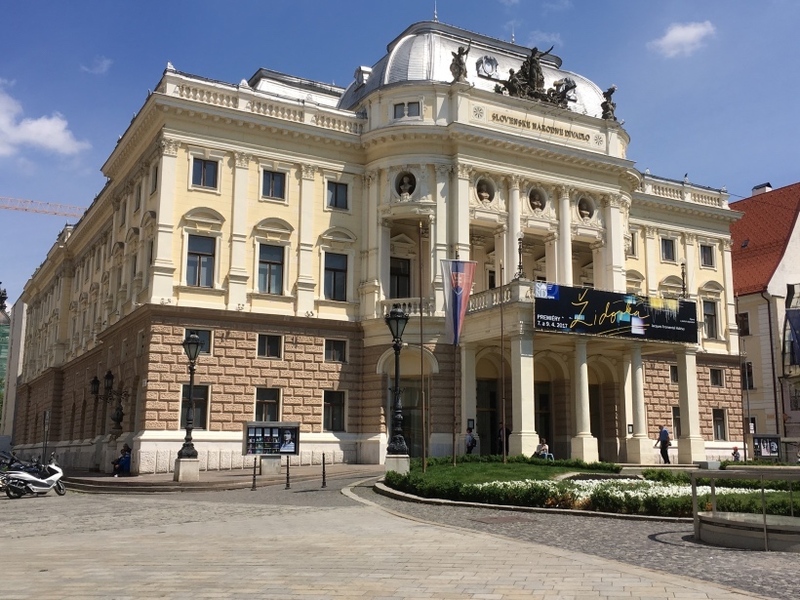 < Slovak National Theatre. 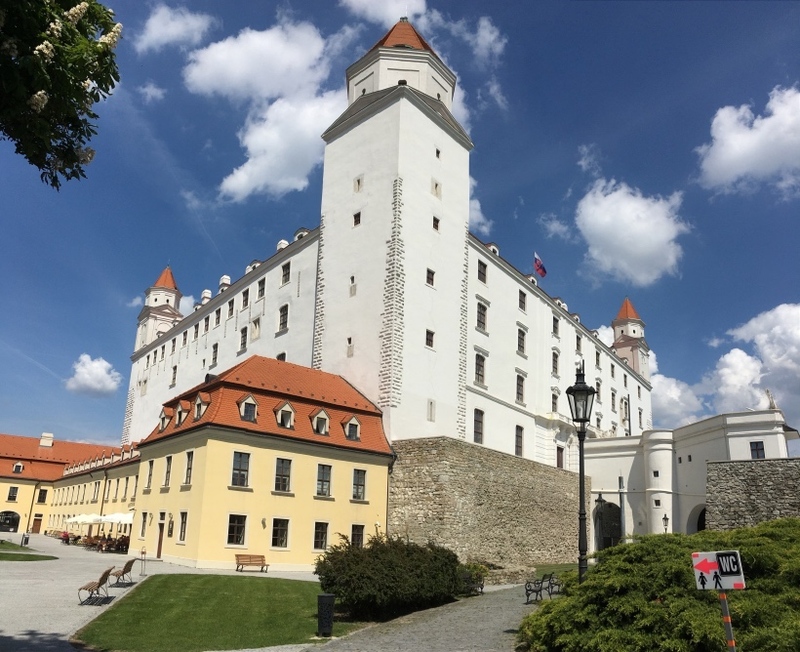 Our car driver for the tour took us to Bratislava Castle, a 1950s reconstruction of the one burned down in 1811. 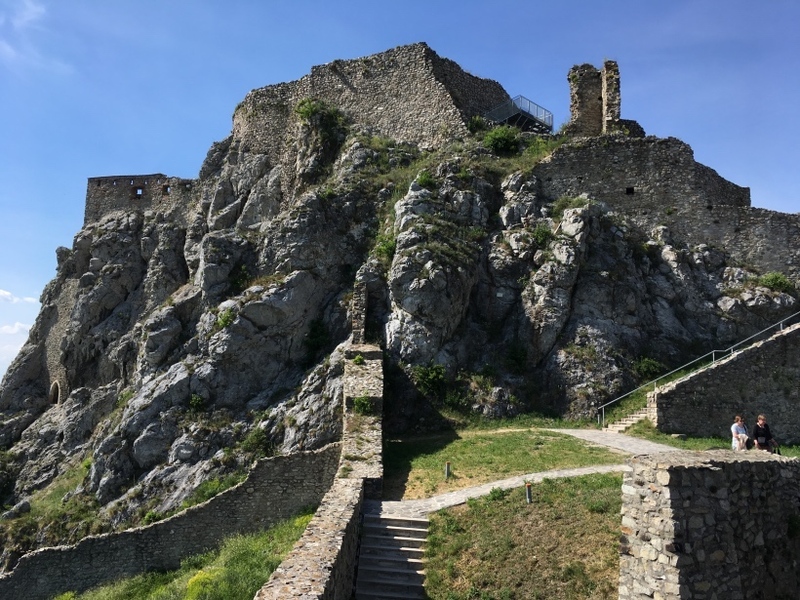 Then our driver took us out into the countryside to the ruins of Devin Castle and we toured the castle ruins, which is on a high hill along side the confluence of the Morava and the Danube Rivers. It was blown up in 1809 by Napoleon's army. < < Devin Castle ruins. 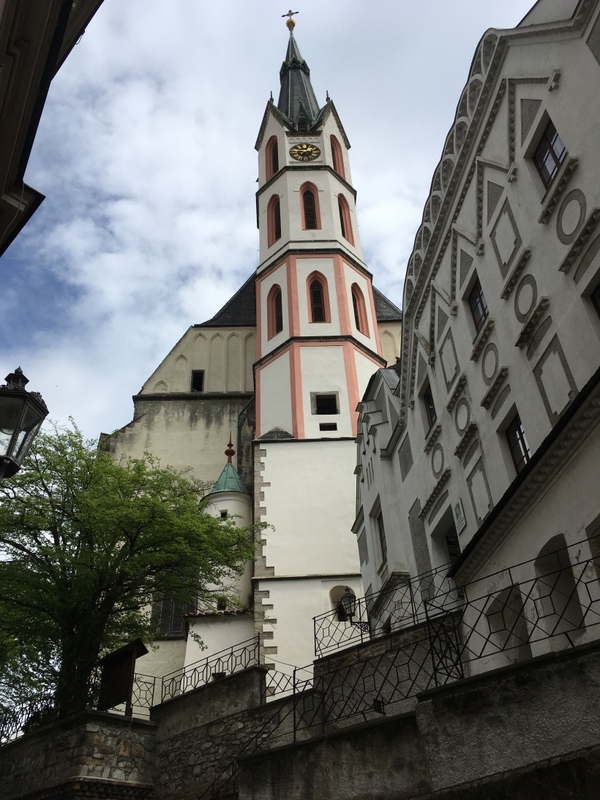 [Wednesday, May 17] We walked to St. Martin's Cathedral and went inside. < St Martin's Cathedral. < Inside St Martin's Cathedral. Then we walked to the House of the Good Shepherd, said to be the narrowest house in Europe. < House of the Good Shepherd. Then we walked to the Little Blue Church which was closed, but the iron gate across the entrance allowed some inside photos. 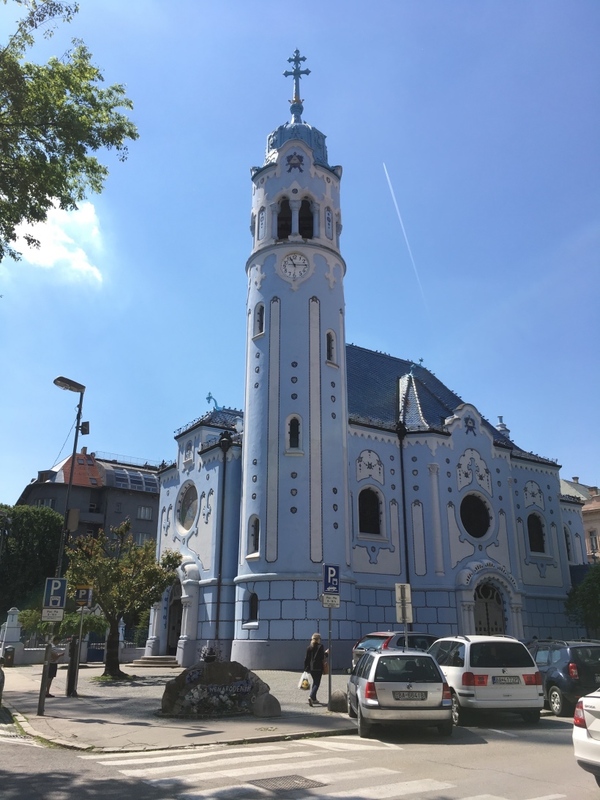 < < The Little Blue Church. We then rode the trolley out in the direction of Devin. We stopped and toured the Botanical Gardens. We rode the trolley a little further and walked up to some apartments and houses to see how they compare to Houston. Then we stopped for a snack and walked back to the hotel. 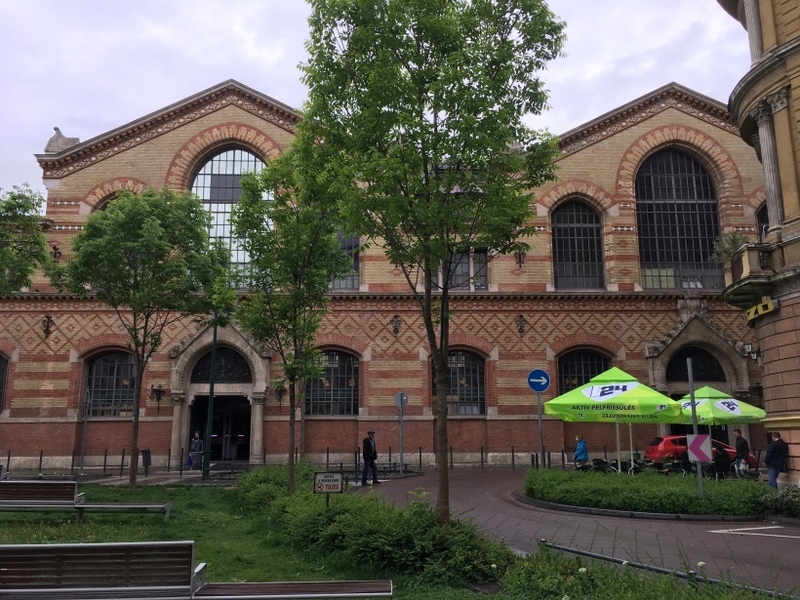 [Thursday, May 18] We walked to the train station this morning to check it out for our departure to Budapest in the afternoon. 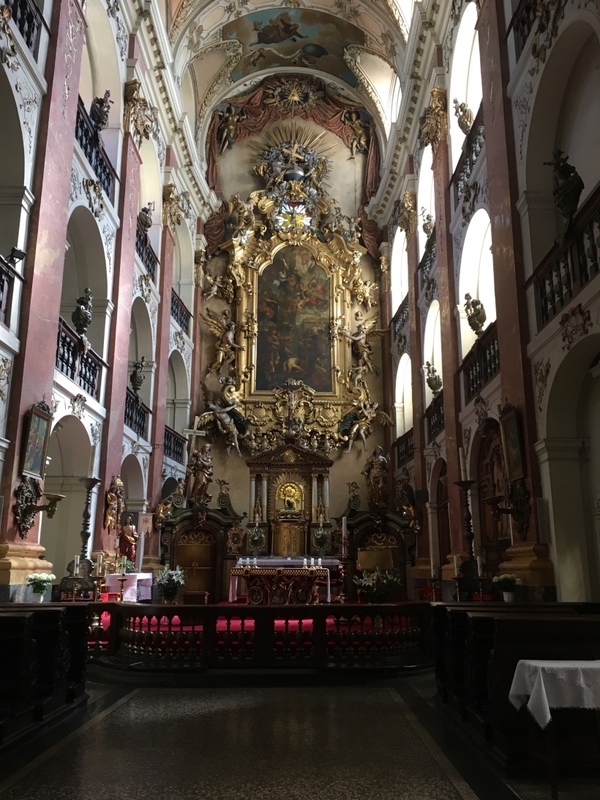 Then we walked to the old town and went inside several beautiful churches that we had not visited. 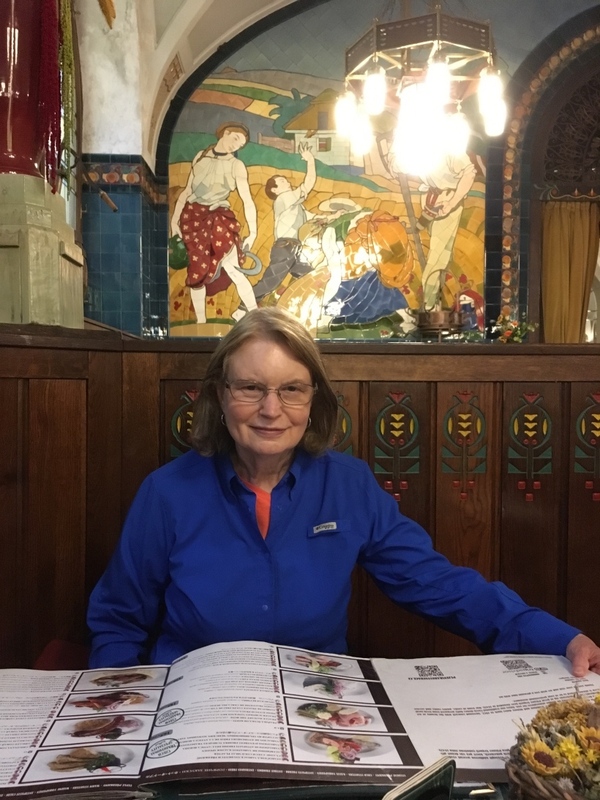 We stopped and ate ice cream and a pizza - our health food for the day - then a stop for coffee and finally back to the hotel, where we were picked up by our taxi driver and taken to the train station. We took the EC 279 train at 15:53 to Budapest. 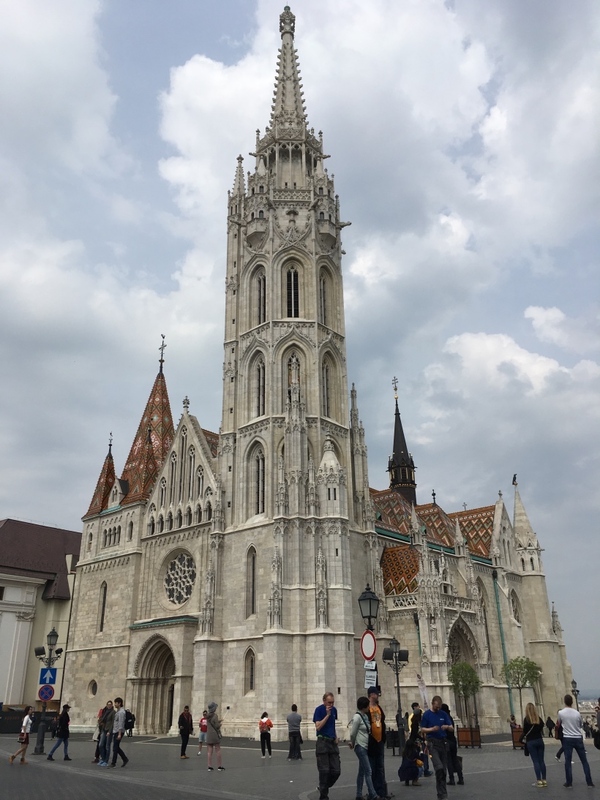 We were delayed for 30 minutes in the town of Vac for some unknown reason, so we arrived late in Budapest, but our taxi was waiting to take us to the Airport Hotel Budapest for the night. [Friday, May 19] We got up at 03:15 and caught the 04:15 shuttle to the airport. We checked into Lufthansa Airlines and ate breakfast in the terminal before we boarded our aircraft to Frankfurt. A weather problem somewhere near Frankfurt caused us to be delayed 35 minutes in taking off from Budapest. 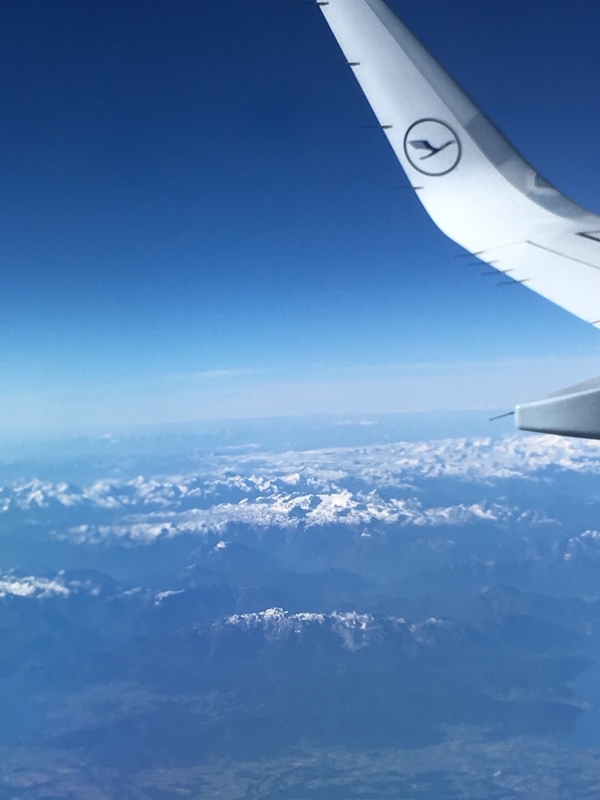 < The snow-covered Alps from our flight. We arrived in time to link up with our flight to IAH. We left Frankfurt at 10:00 and after a 10-hour flight we arrived in Houston. We made it back home about 4PM, after a quick stop a Kroger. 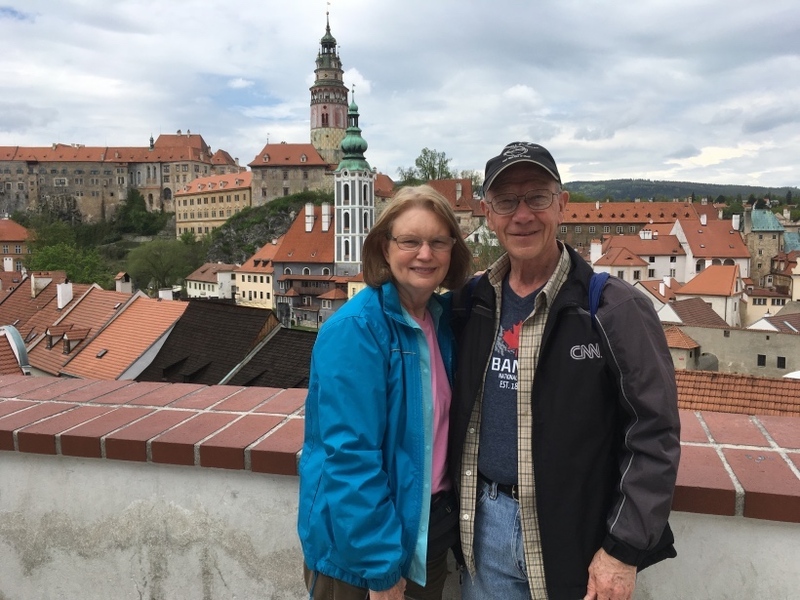 This draws to a close our brief vacation to Budapest, Prague and Bratislava. We hope you enjoyed the photos and brief descriptions of our activities. God willing, join us again soon for another travel adventure.